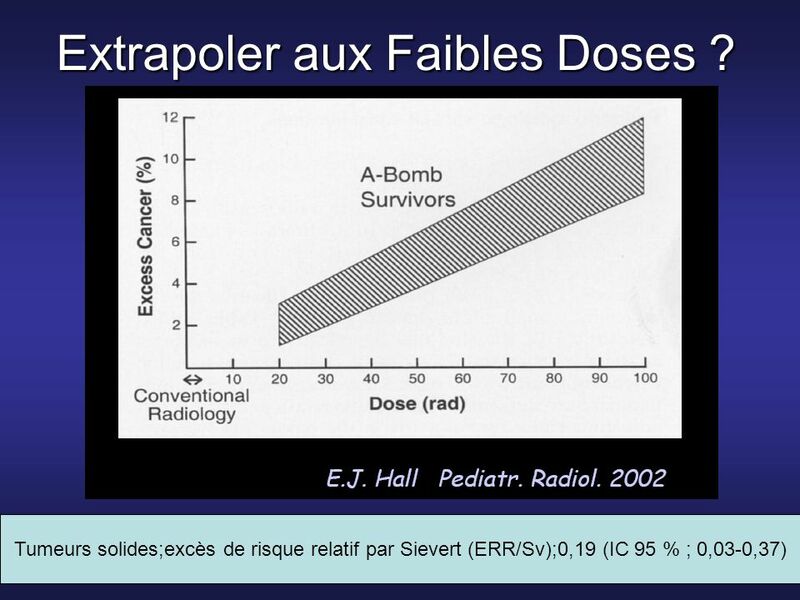 10 Extrapoler aux Faibles Doses ? 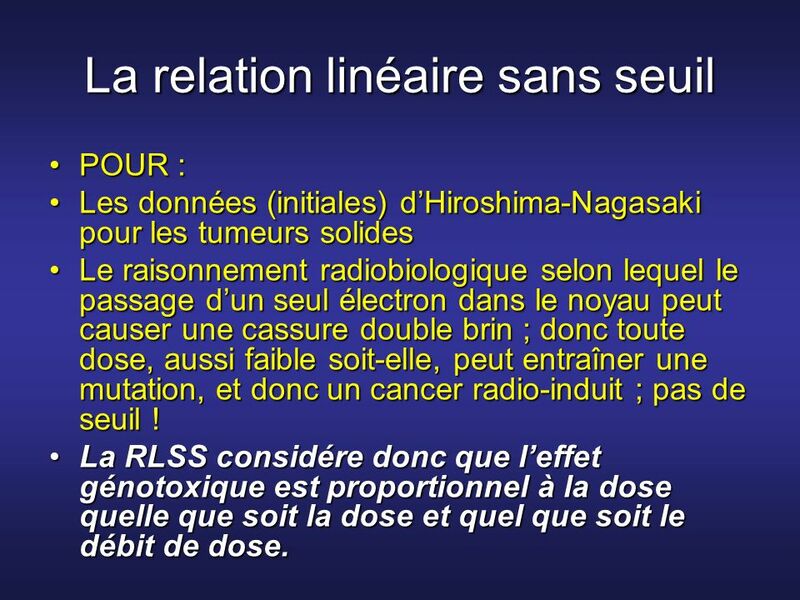 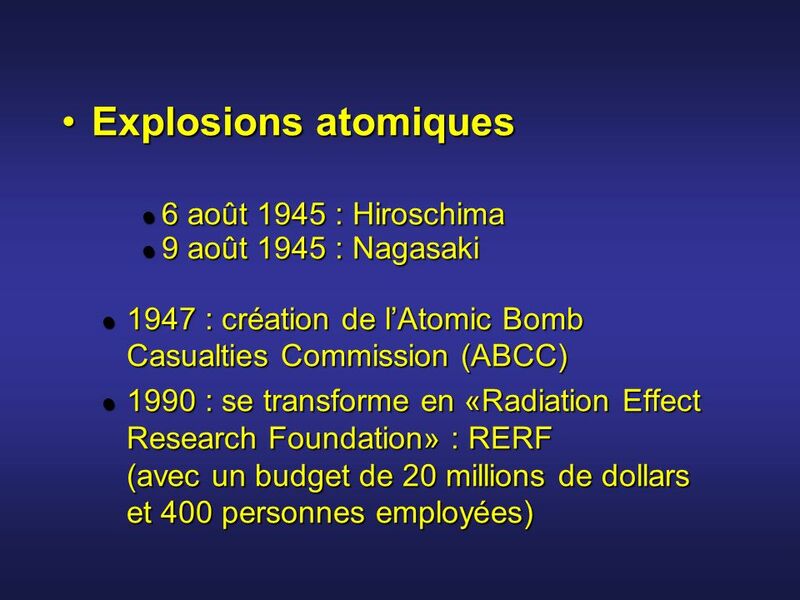 POUR : Les données (initiales) d’Hiroshima-Nagasaki pour les tumeurs solides Le raisonnement radiobiologique selon lequel le passage d’un seul électron dans le noyau peut causer une cassure double brin ; donc toute dose, aussi faible soit-elle, peut entraîner une mutation, et donc un cancer radio-induit ; pas de seuil ! 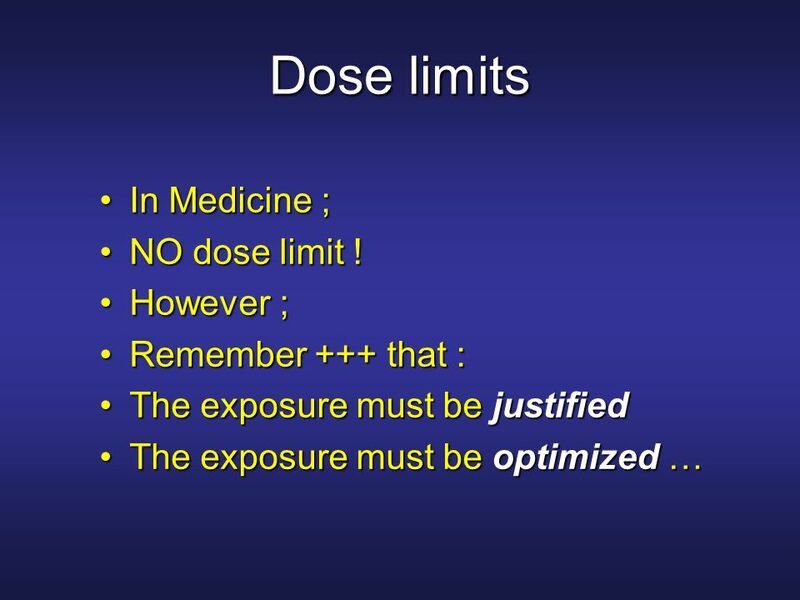 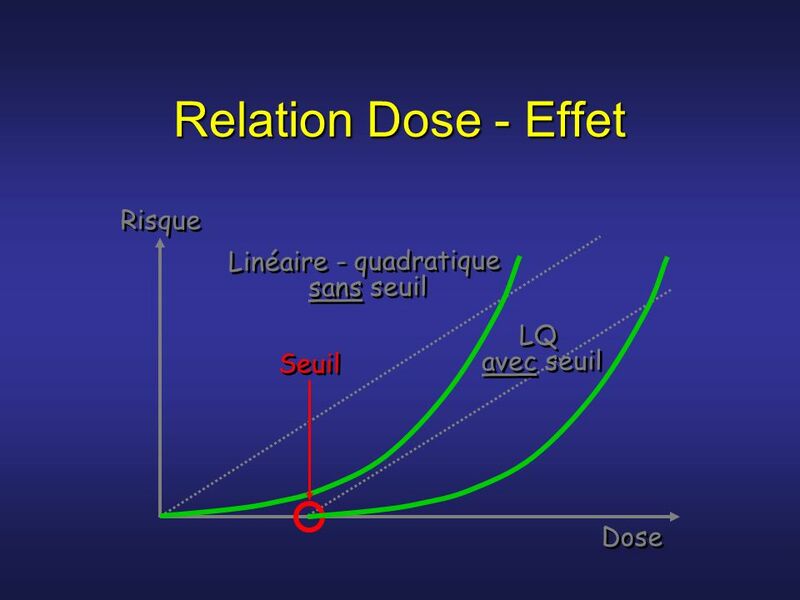 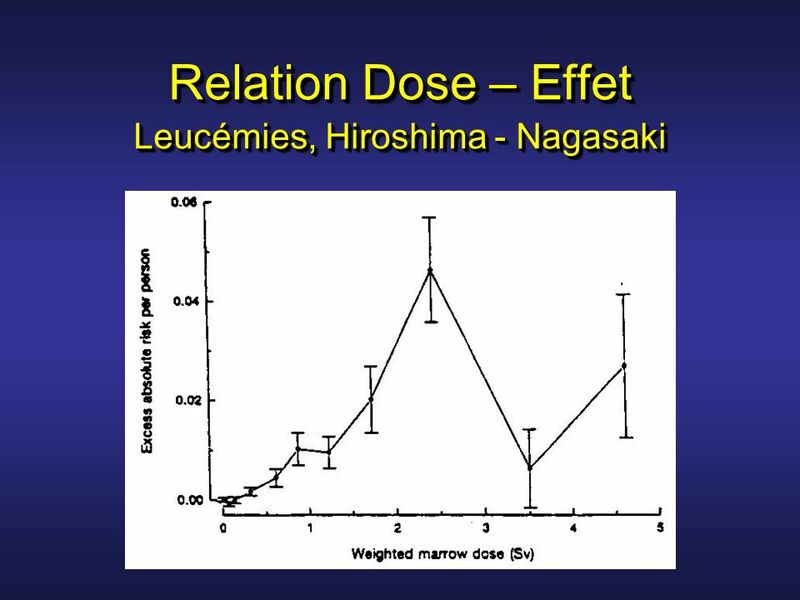 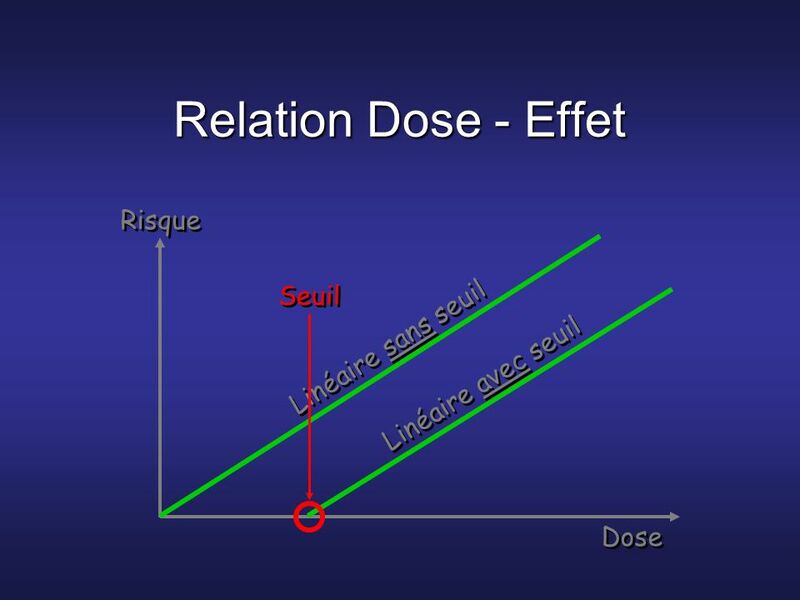 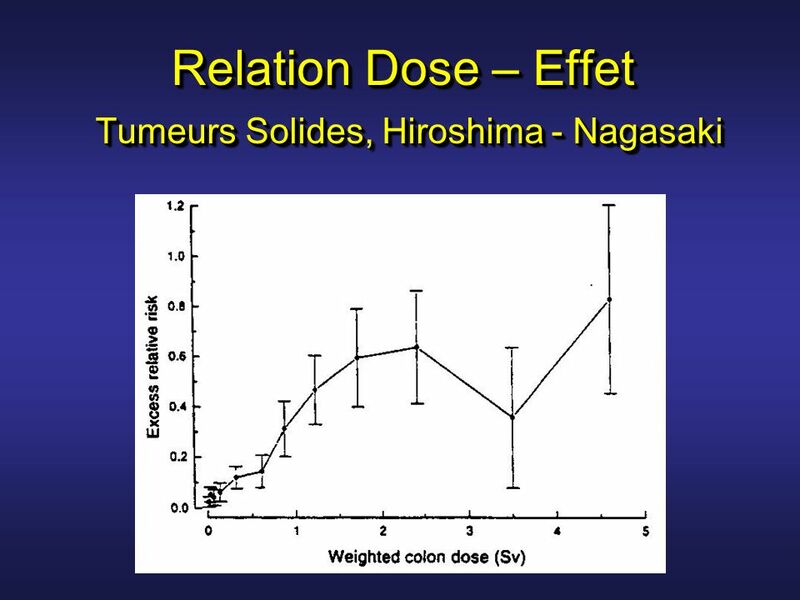 La RLSS considére donc que l’effet génotoxique est proportionnel à la dose quelle que soit la dose et quel que soit le débit de dose. 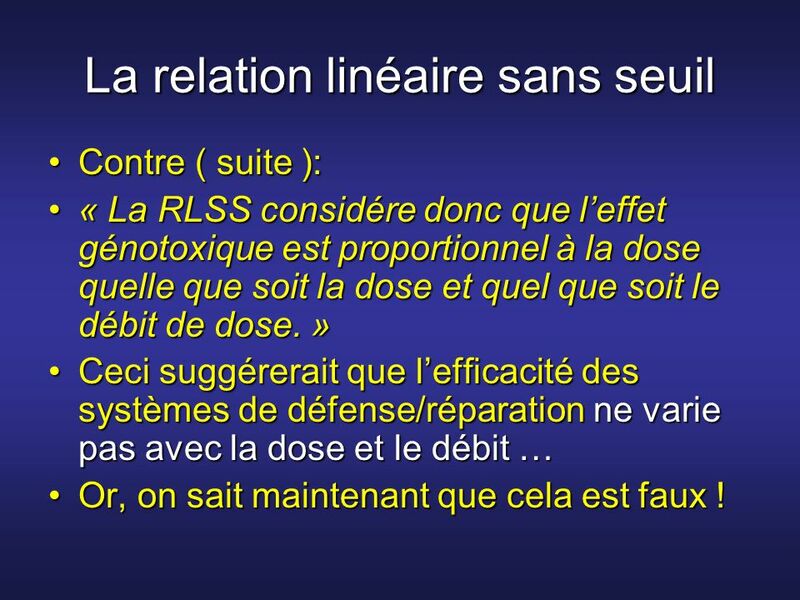 Contre ( suite ): « La RLSS considére donc que l’effet génotoxique est proportionnel à la dose quelle que soit la dose et quel que soit le débit de dose. 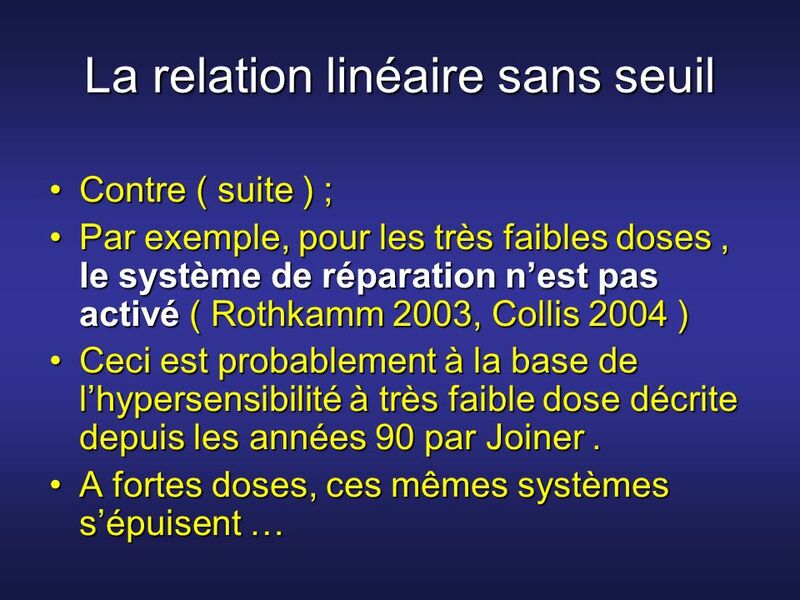 » Ceci suggérerait que l’efficacité des systèmes de défense/réparation ne varie pas avec la dose et le débit … Or, on sait maintenant que cela est faux ! 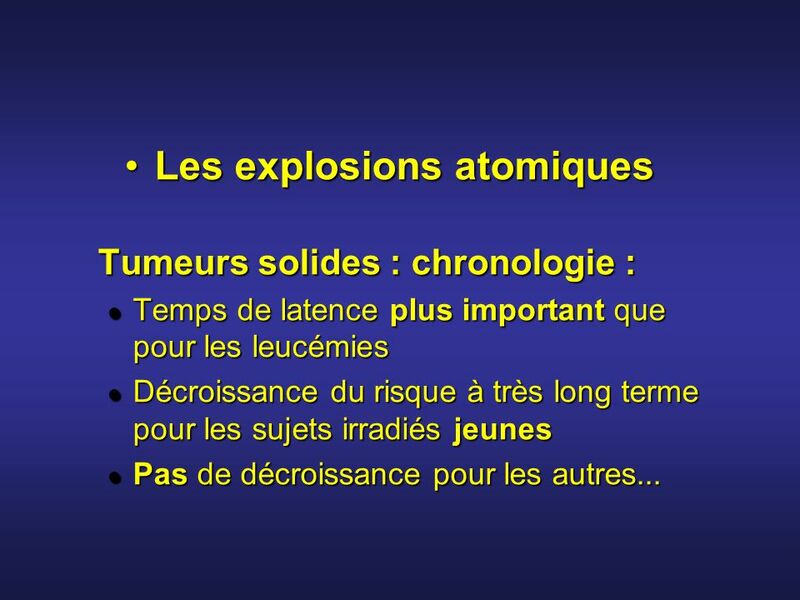 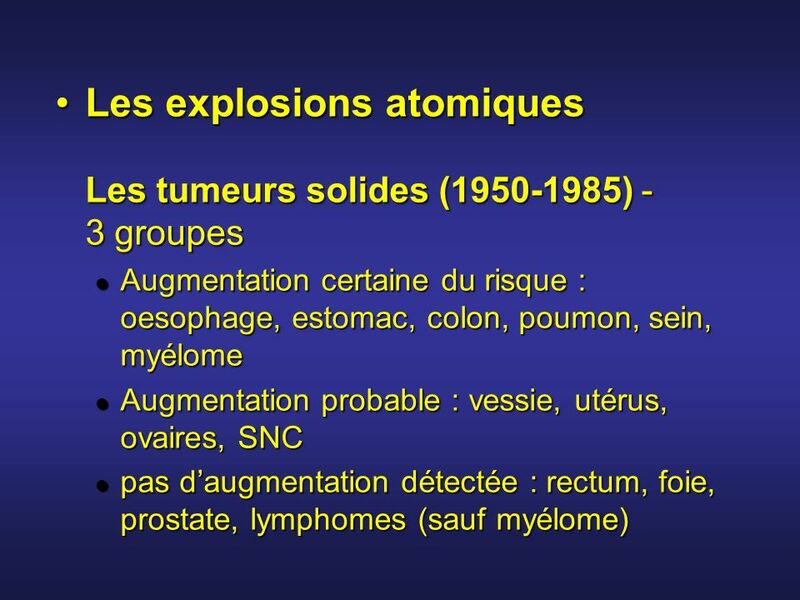 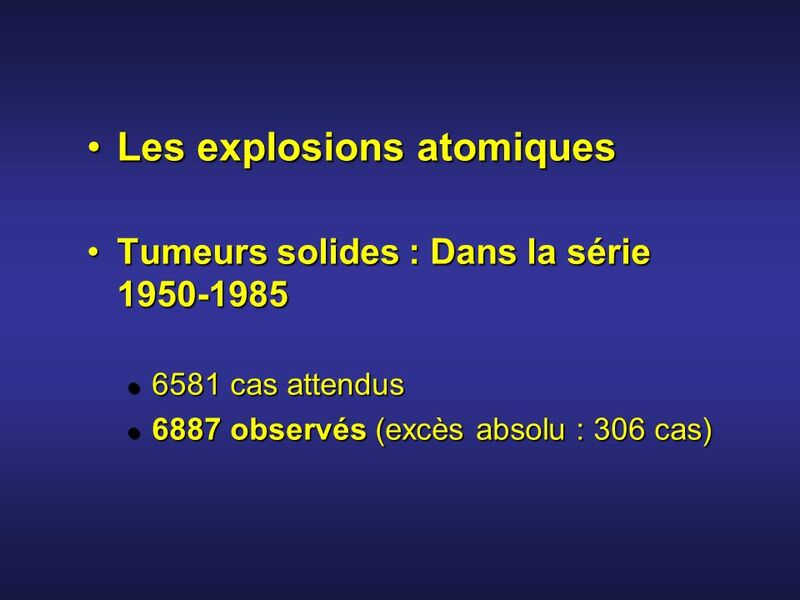 Contre ( suite ) ; La surestimation des effets carcinogènes n’est pas innocente ; Calculs théoriques du nombre de morts ( virtuels ) après Tchernobyl atteignant 6 millions !! 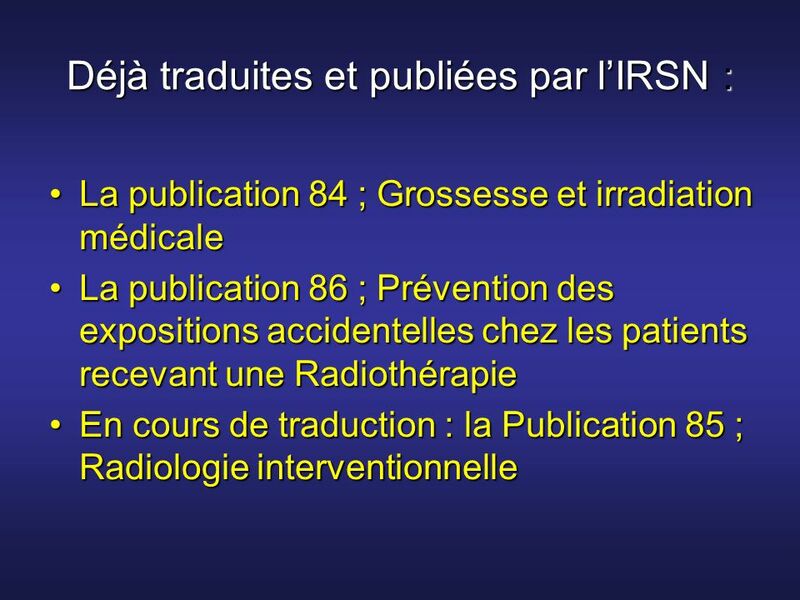 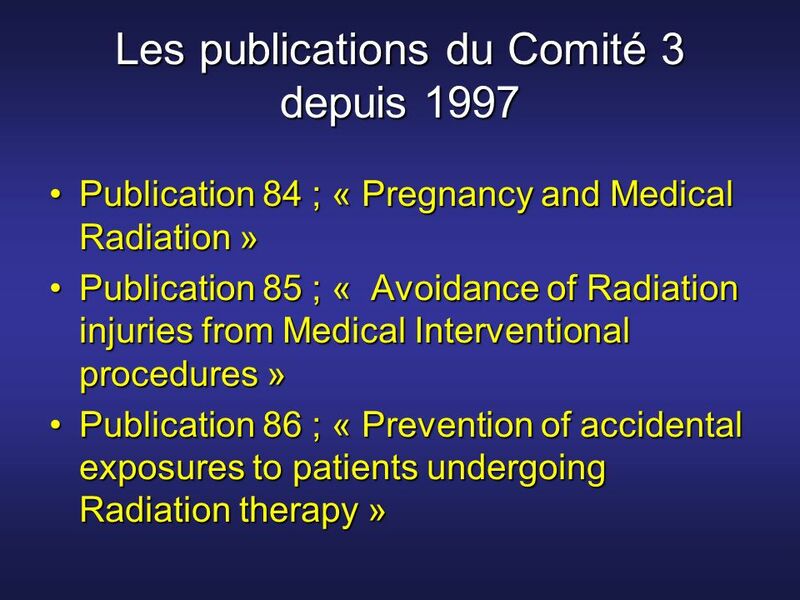 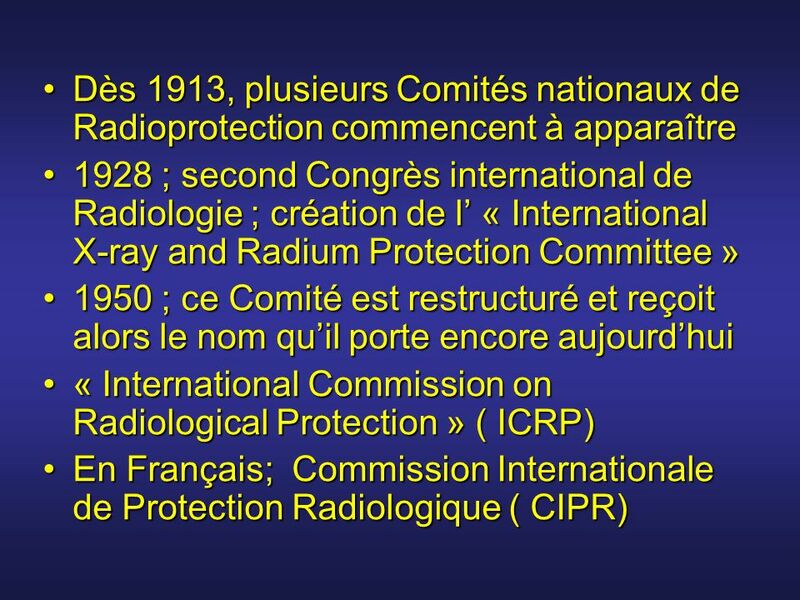 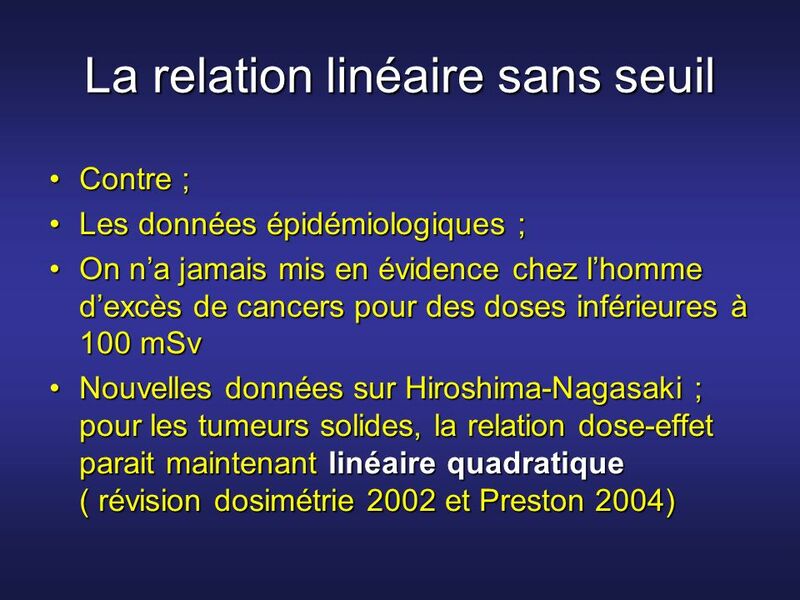 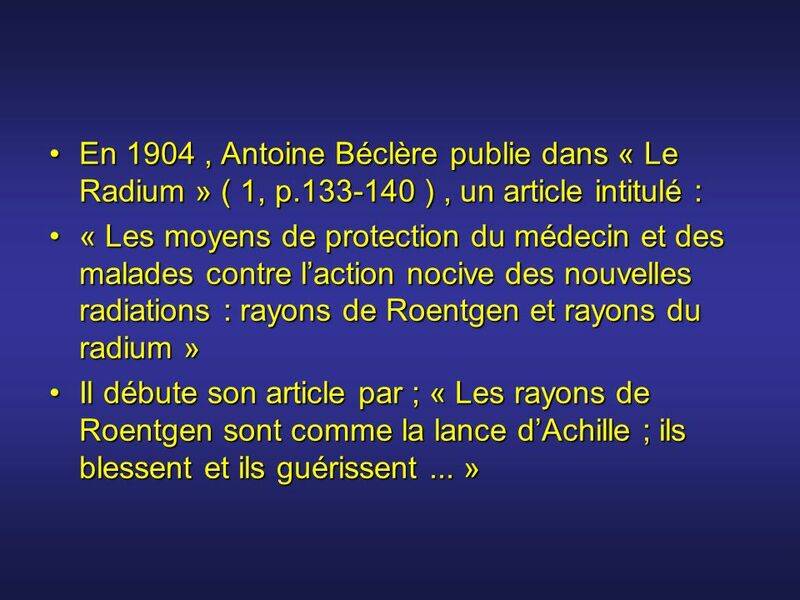 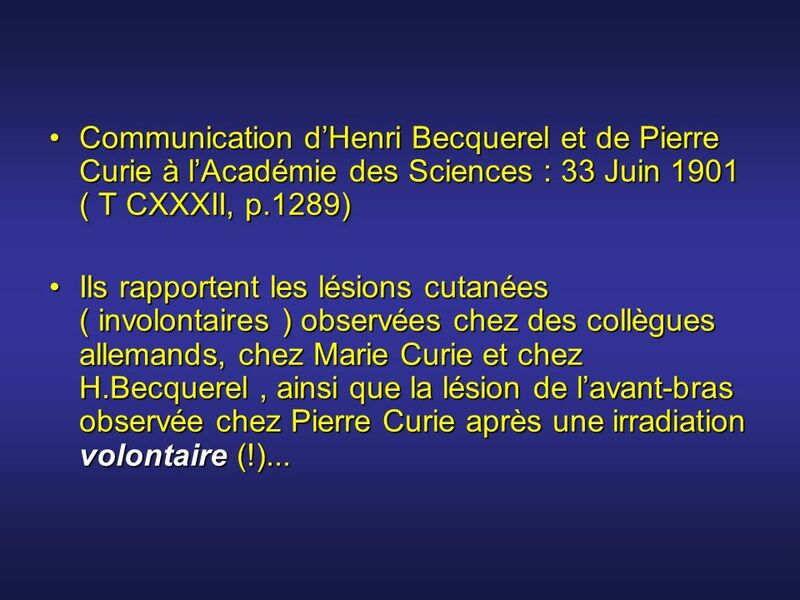 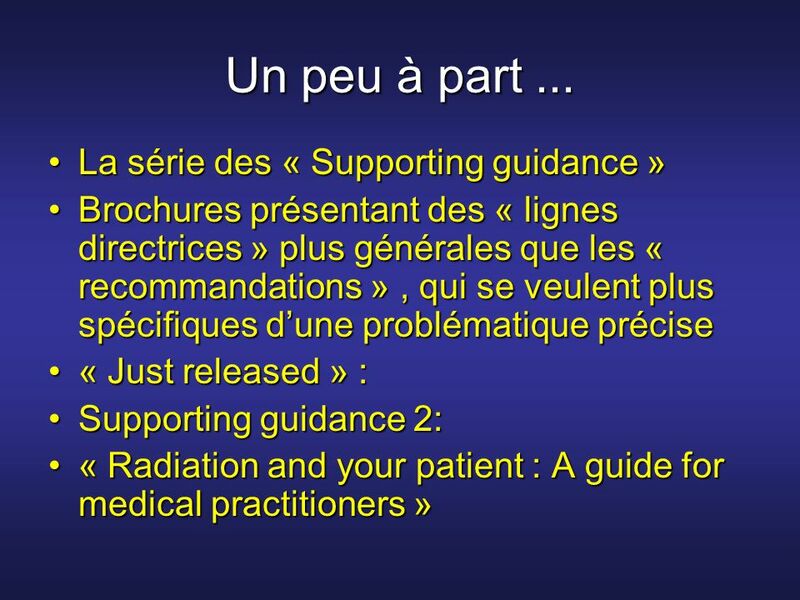 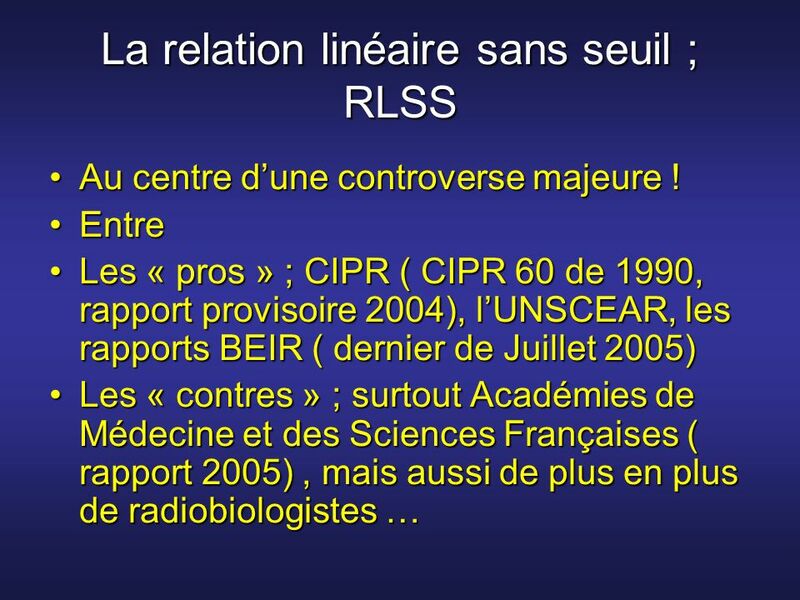 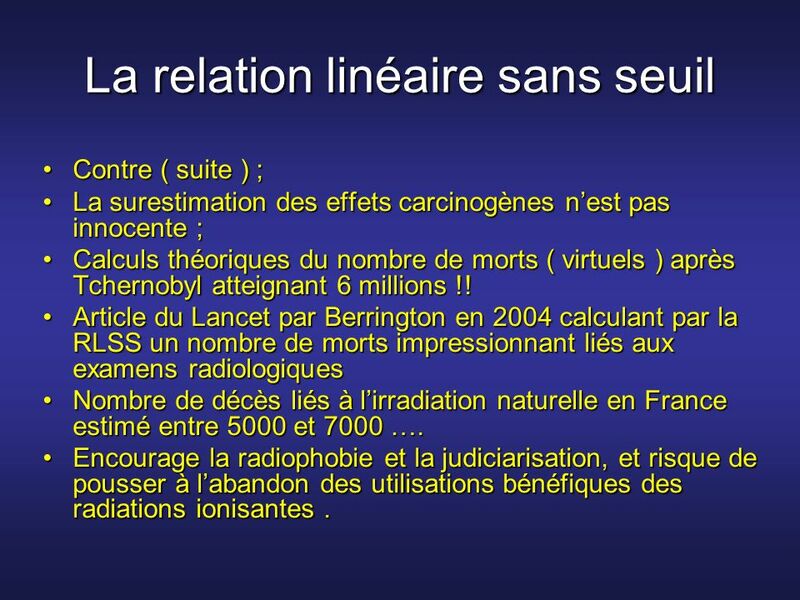 Article du Lancet par Berrington en 2004 calculant par la RLSS un nombre de morts impressionnant liés aux examens radiologiques Nombre de décès liés à l’irradiation naturelle en France estimé entre 5000 et 7000 …. 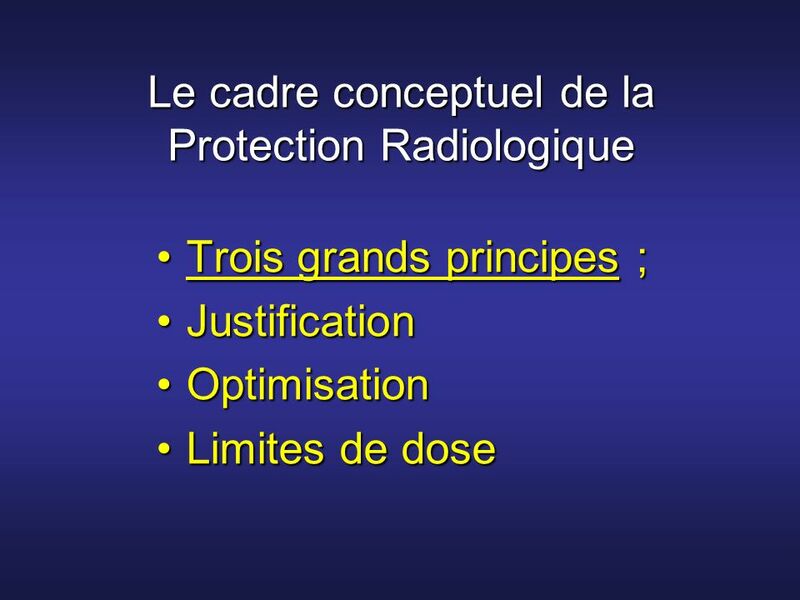 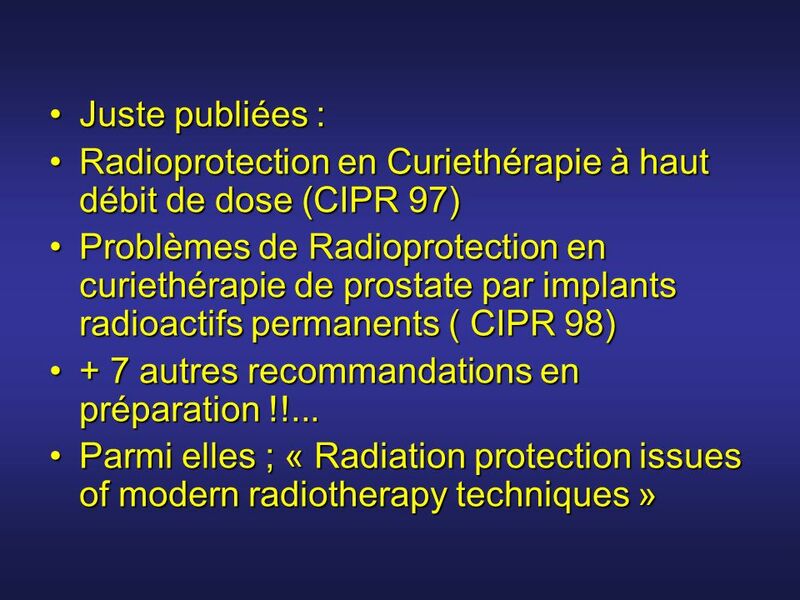 Encourage la radiophobie et la judiciarisation, et risque de pousser à l’abandon des utilisations bénéfiques des radiations ionisantes . 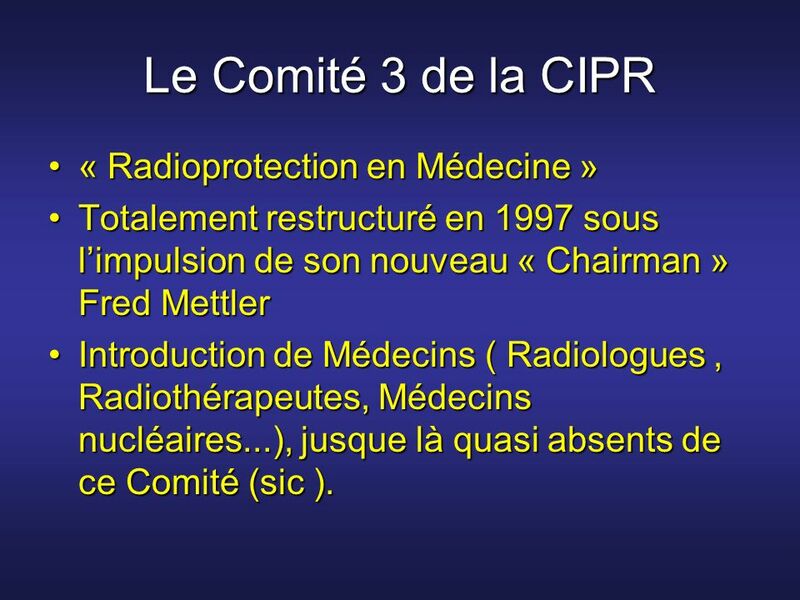 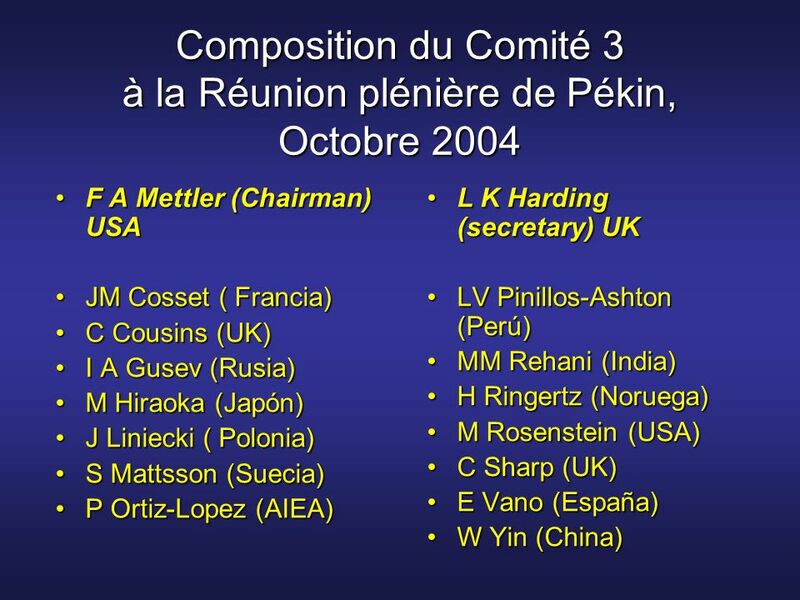 Totalement restructuré en 1997 sous l’impulsion de son nouveau « Chairman » Fred Mettler Introduction de Médecins ( Radiologues , Radiothérapeutes, Médecins nucléaires...), jusque là quasi absents de ce Comité (sic ). 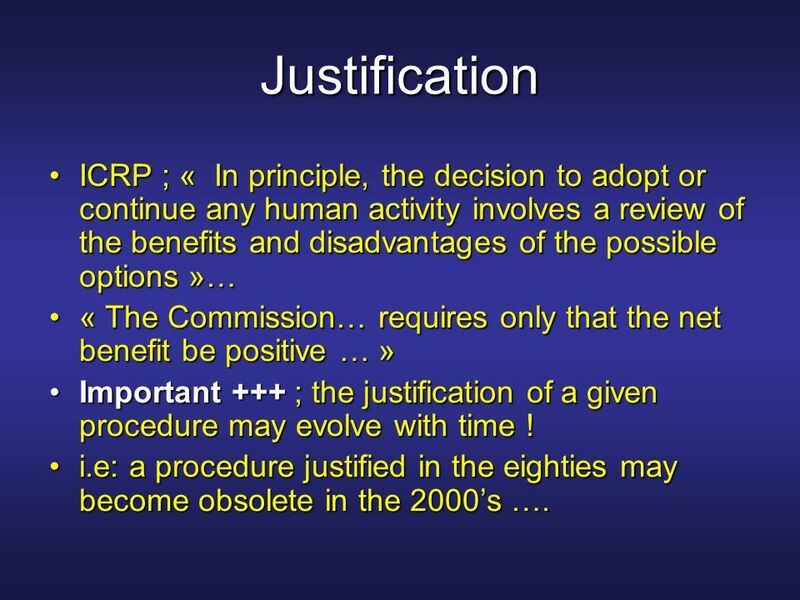 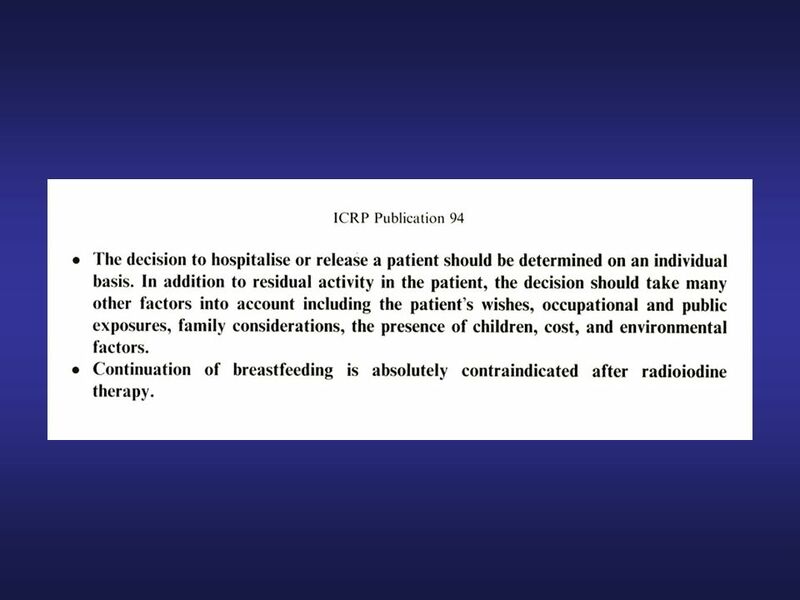 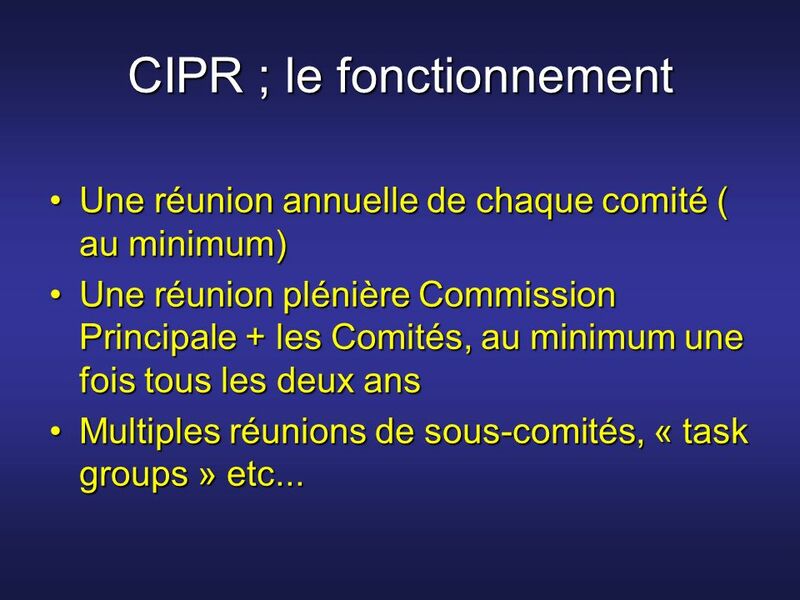 66 Justification ICRP ; « In principle, the decision to adopt or continue any human activity involves a review of the benefits and disadvantages of the possible options »… « The Commission… requires only that the net benefit be positive … » Important +++ ; the justification of a given procedure may evolve with time ! 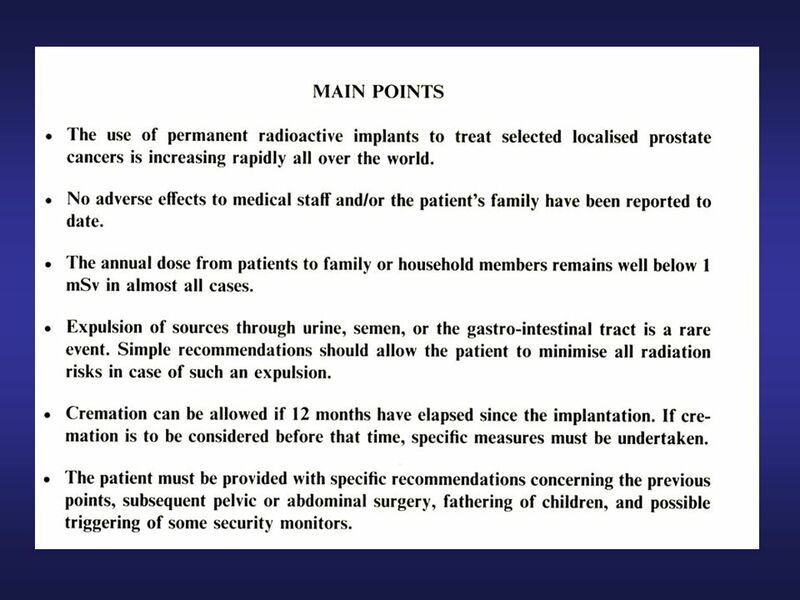 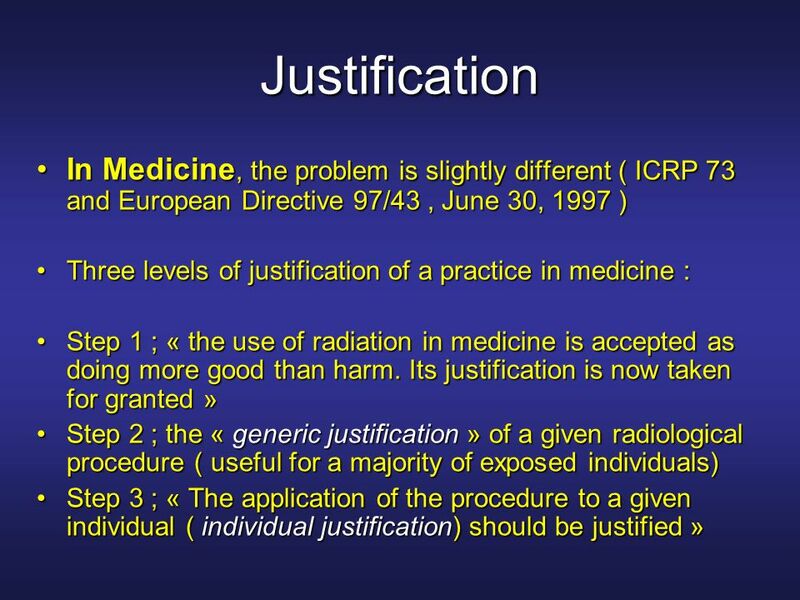 i.e: a procedure justified in the eighties may become obsolete in the 2000’s …. 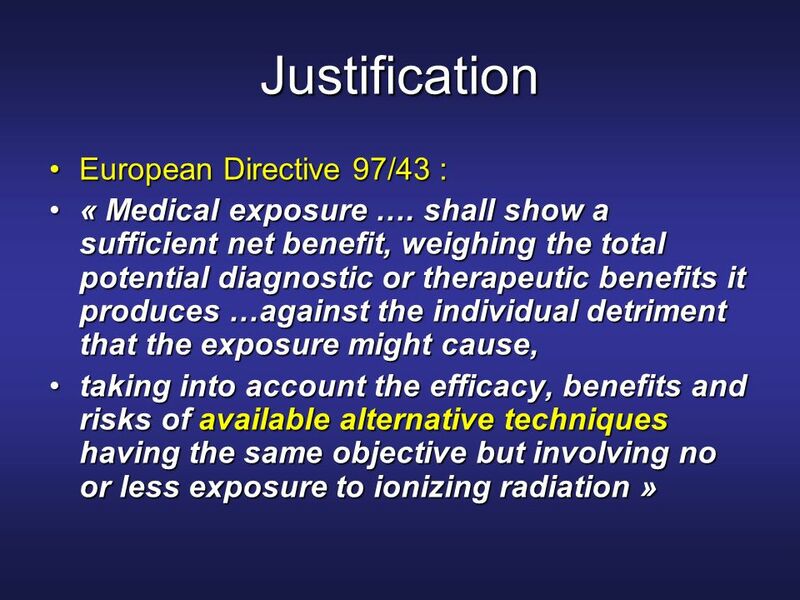 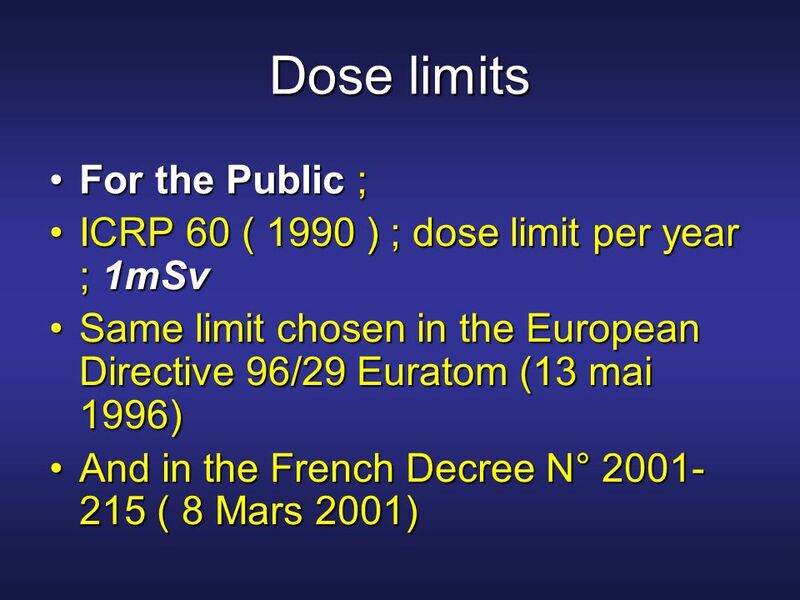 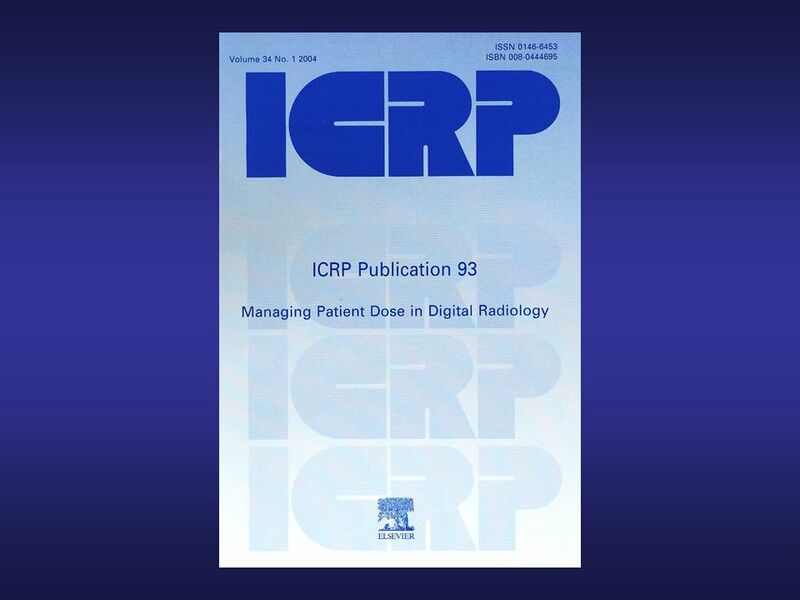 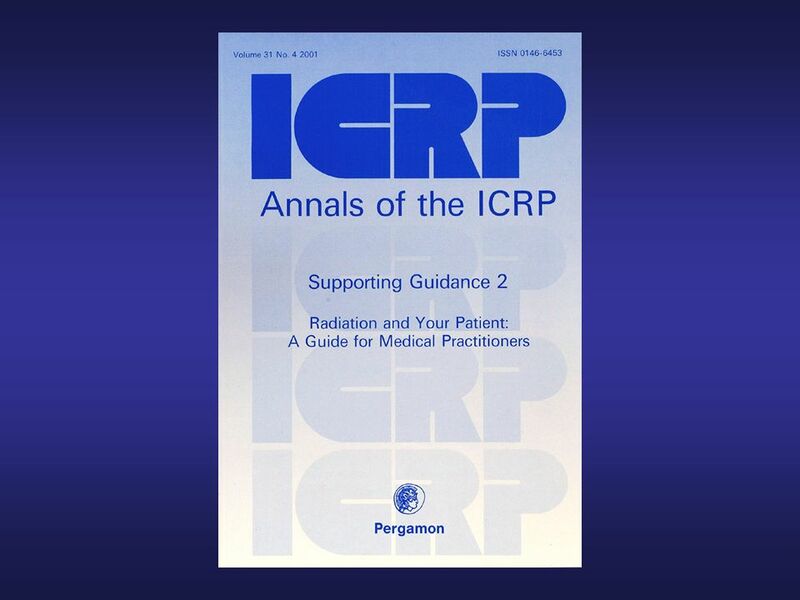 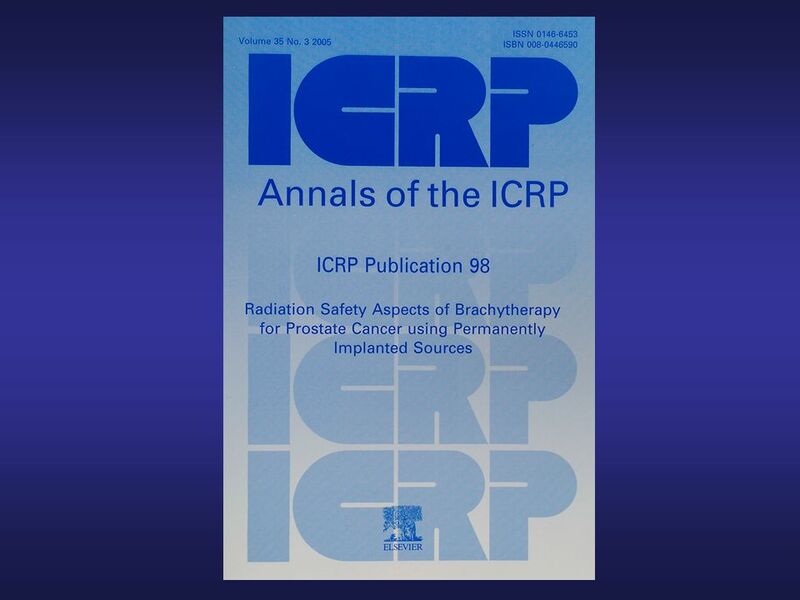 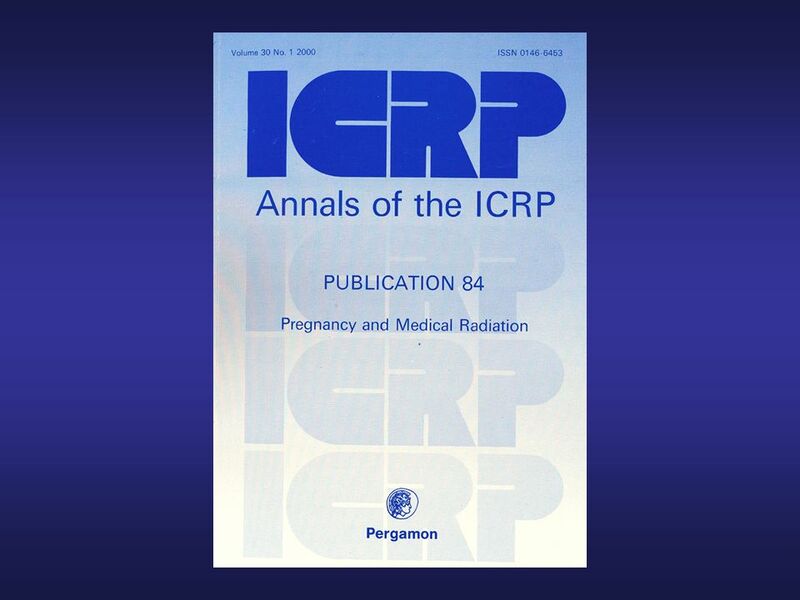 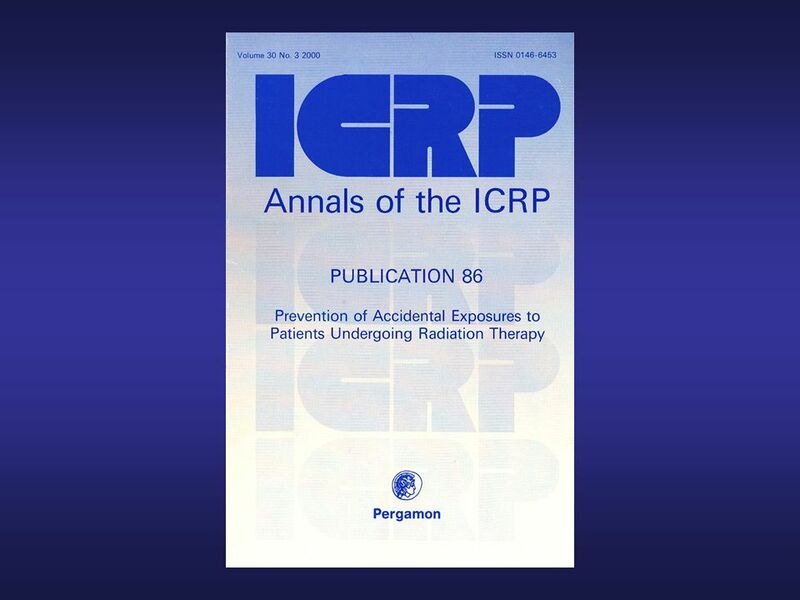 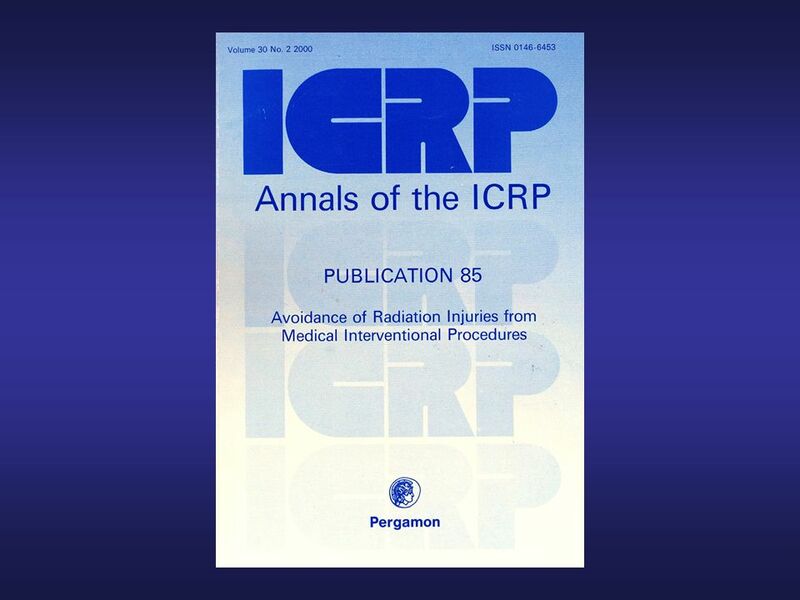 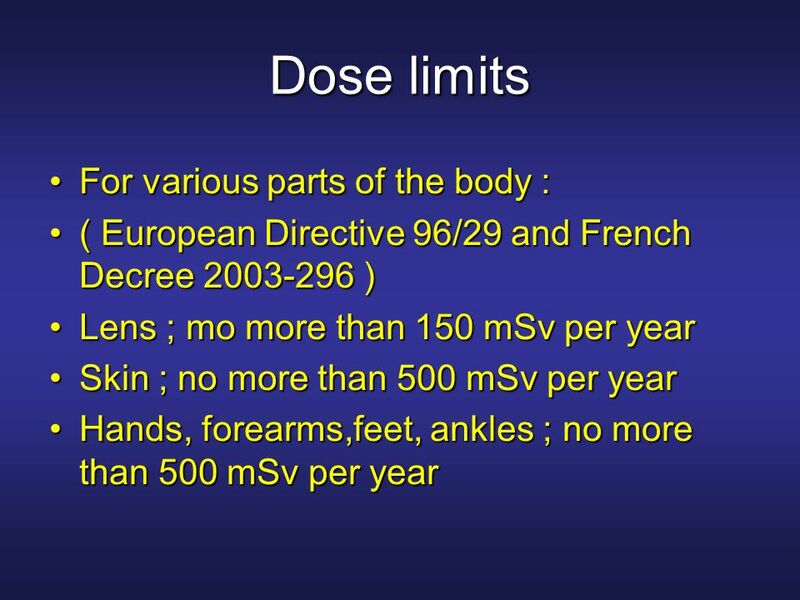 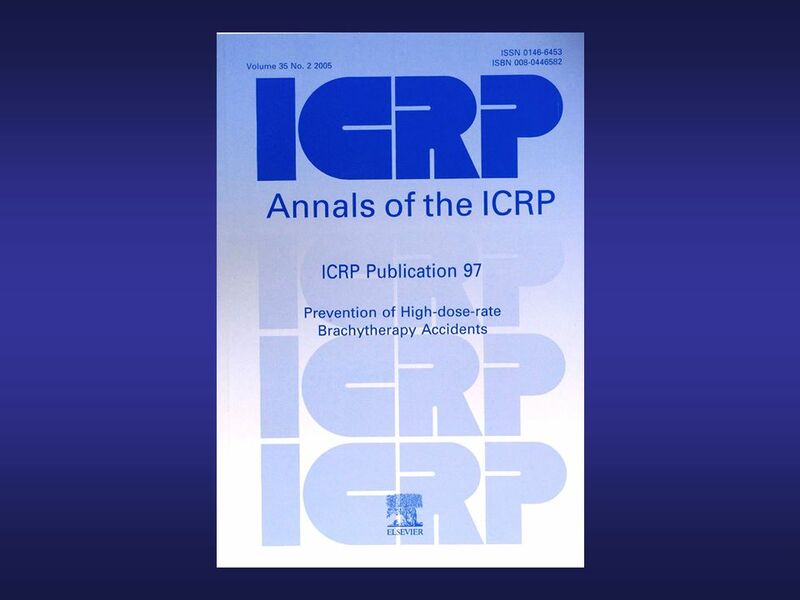 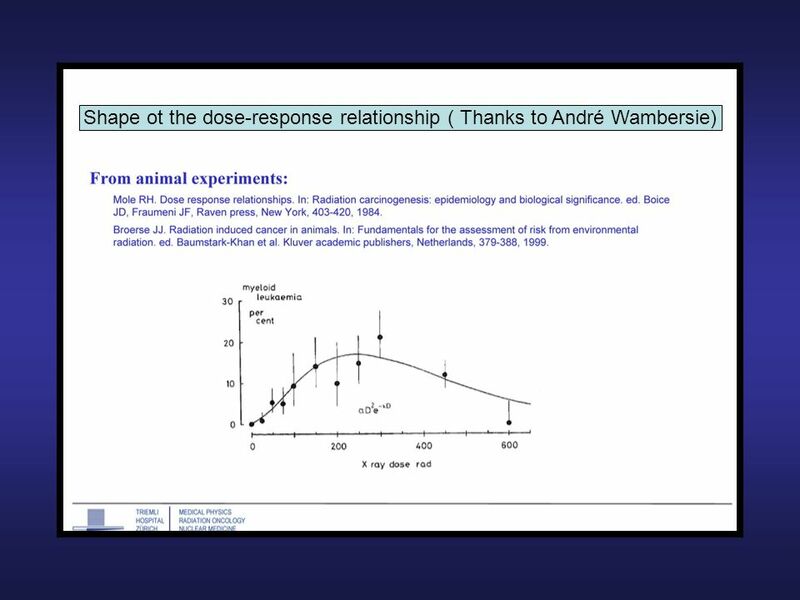 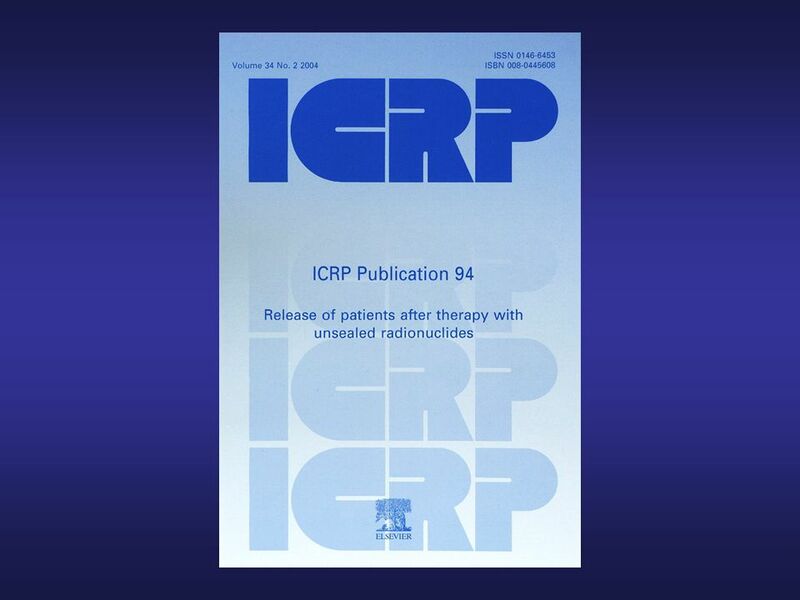 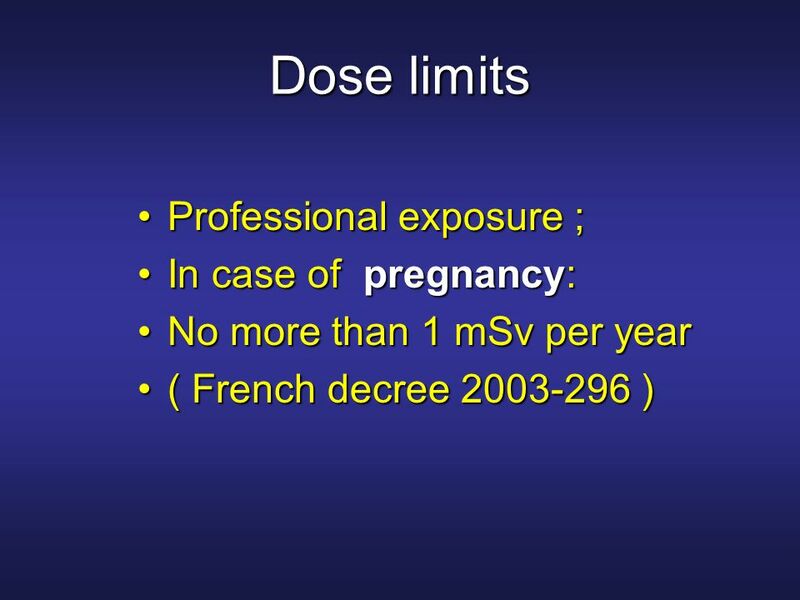 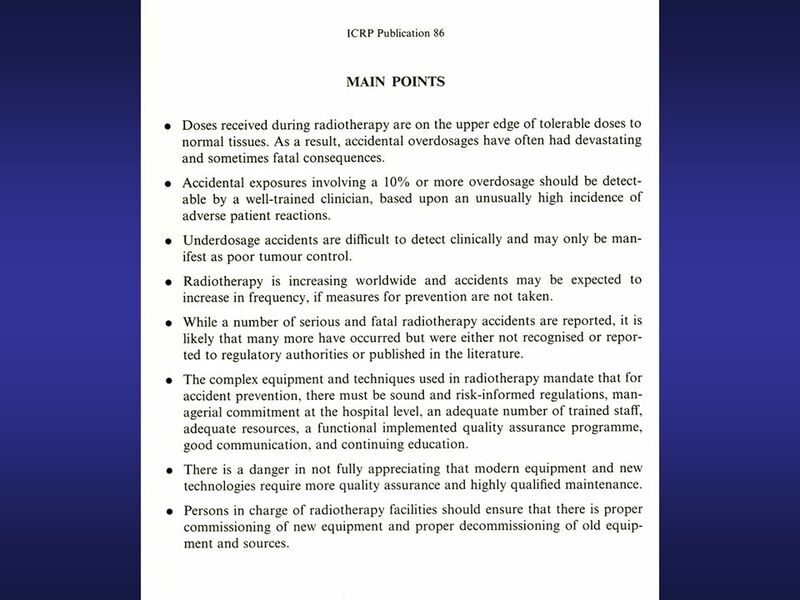 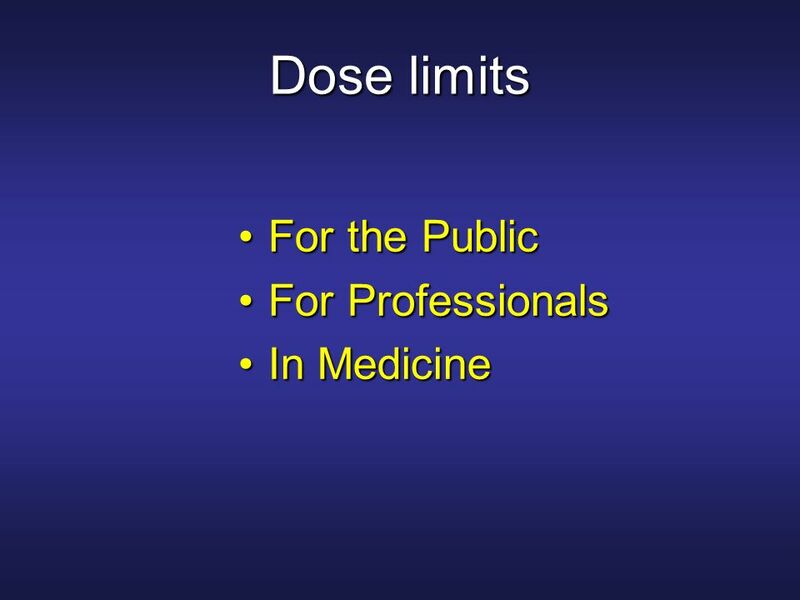 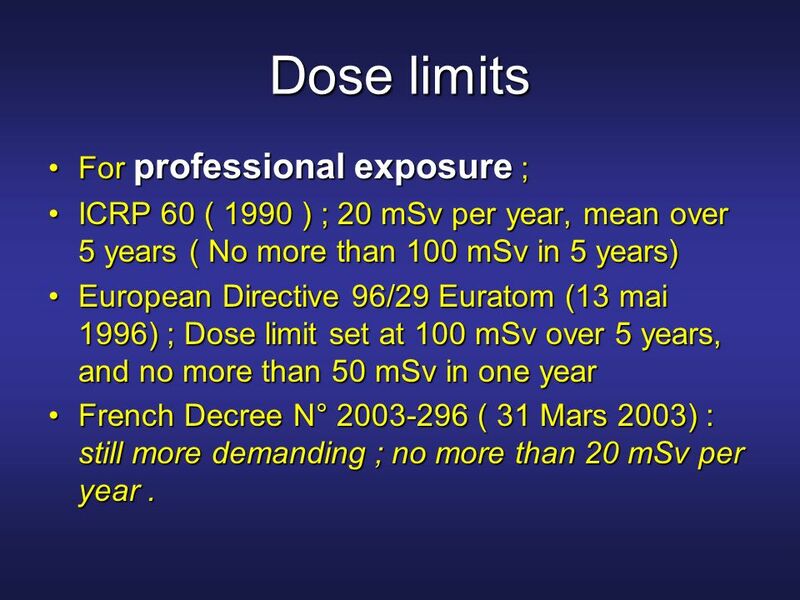 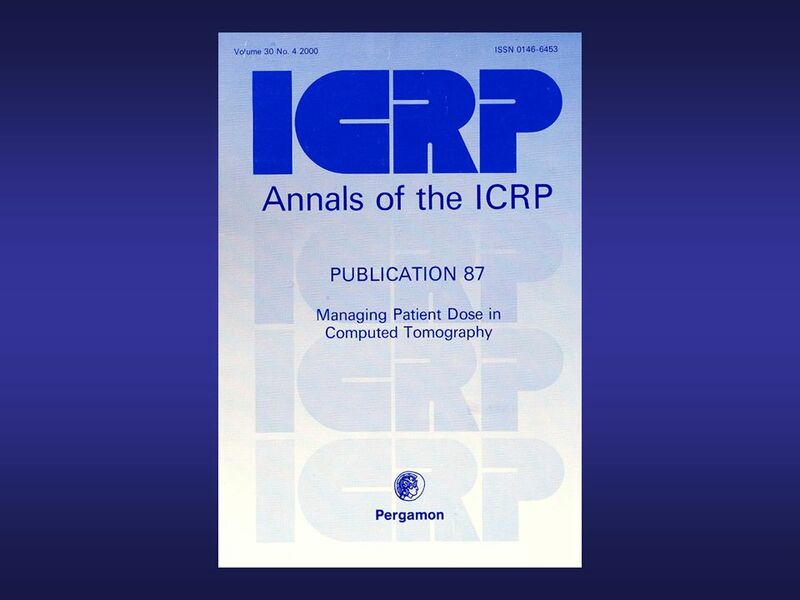 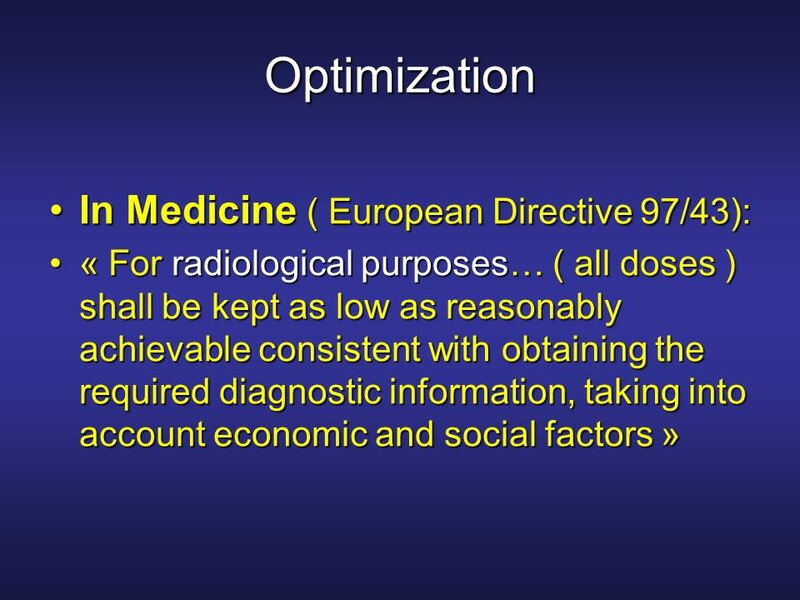 ICRP 60 ( 1990 ) ; 20 mSv per year, mean over 5 years ( No more than 100 mSv in 5 years) European Directive 96/29 Euratom (13 mai 1996) ; Dose limit set at 100 mSv over 5 years, and no more than 50 mSv in one year French Decree N° ( 31 Mars 2003) : still more demanding ; no more than 20 mSv per year . IMRT ( and other new techniques ? ) 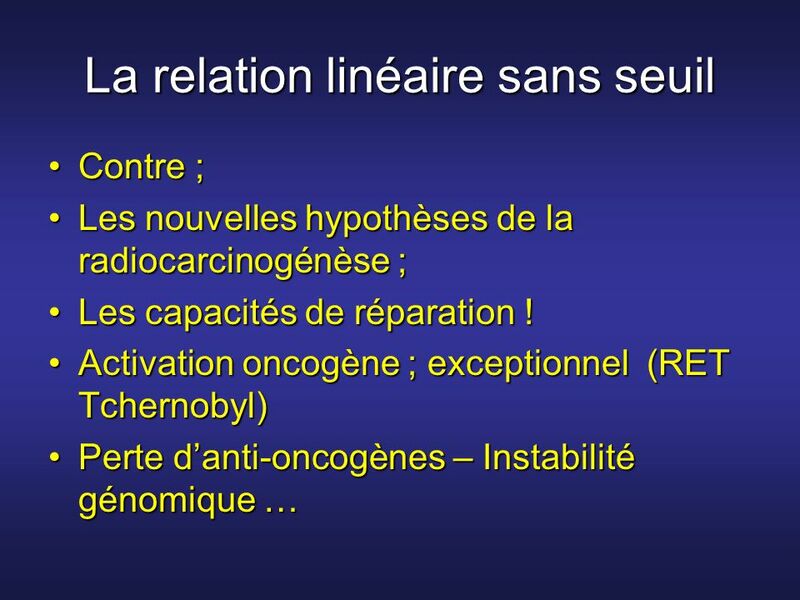 could double the risk of secondary radio-induced cancers ( Followill 1997, Verellen 1999, Hall 2003, Kry 2005, Hall 2006) ? 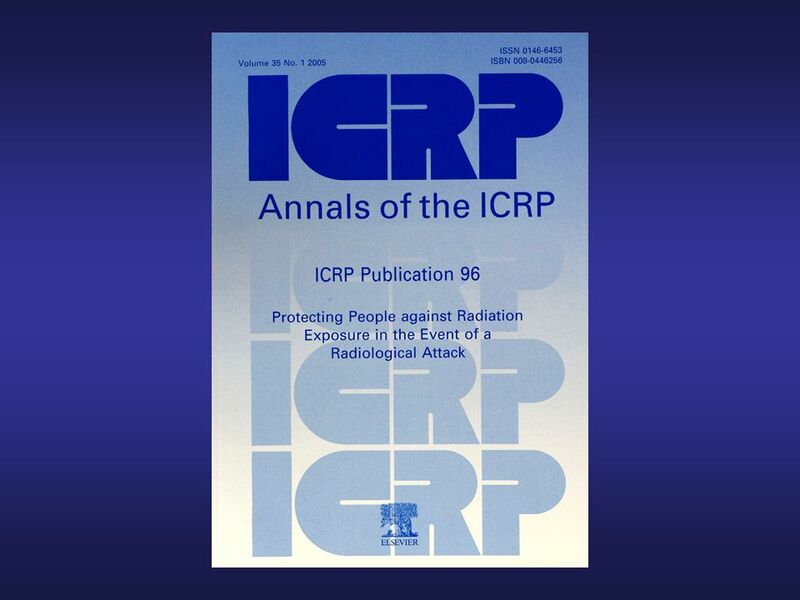 Models to be discussed ( ICRP 60)… The main ( the only ?) 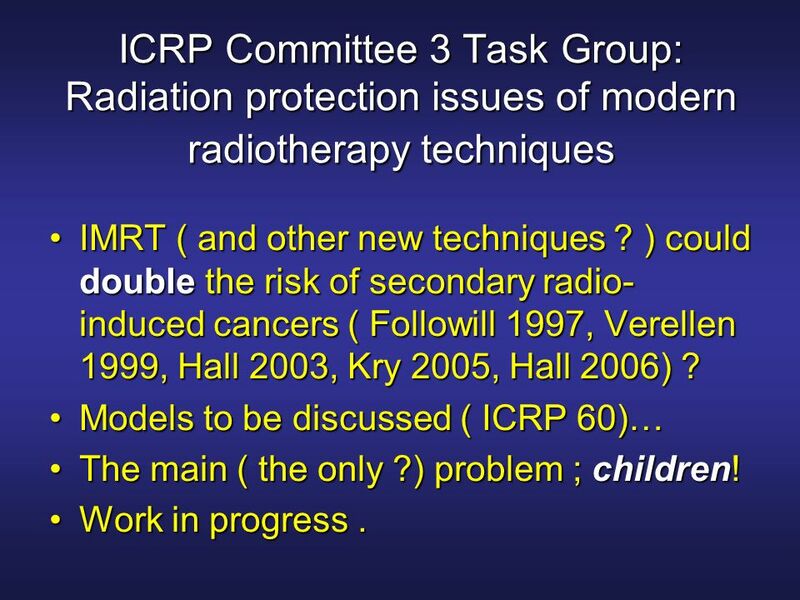 problem ; children! 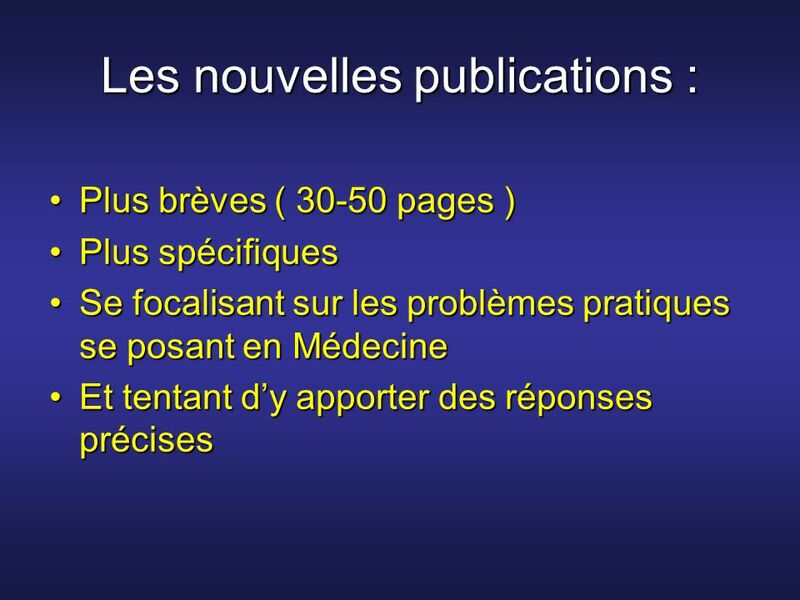 Work in progress . 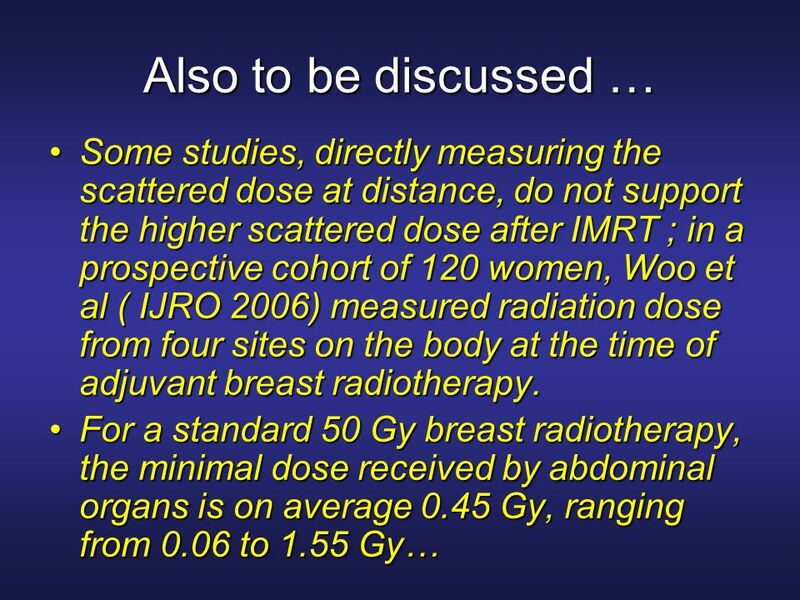 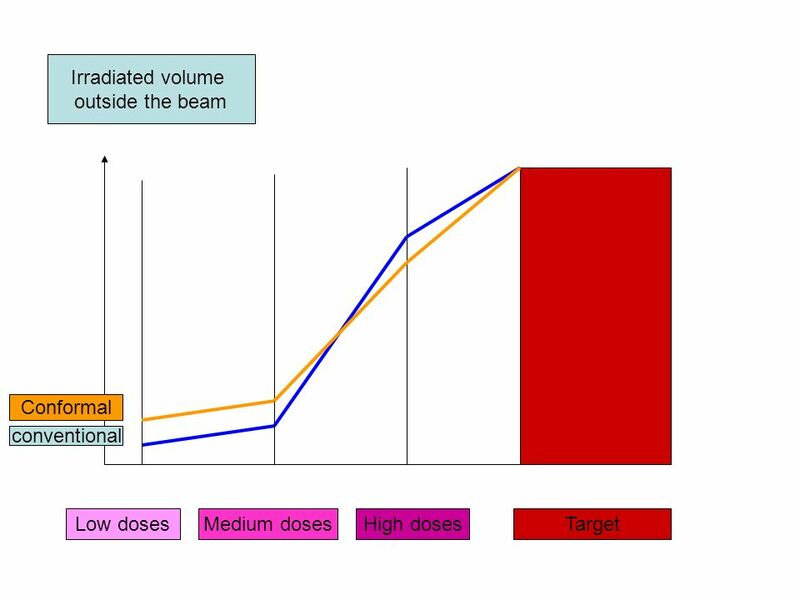 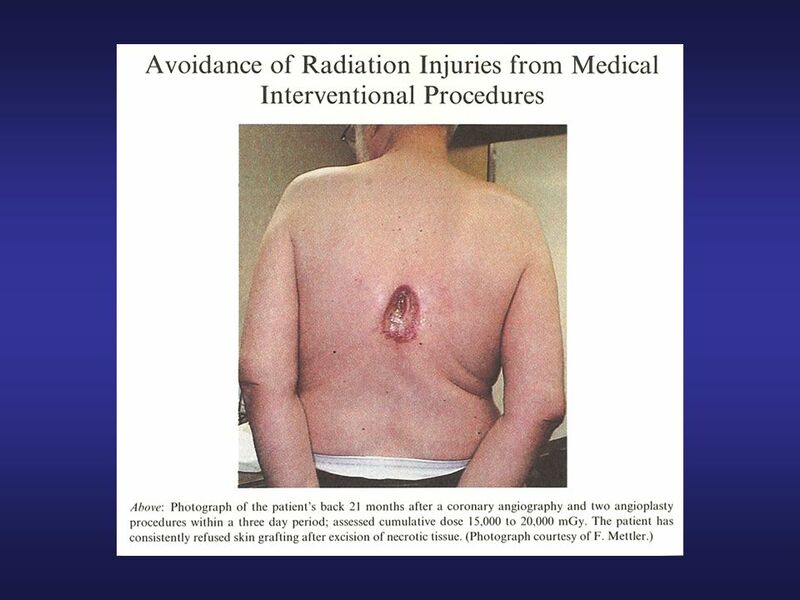 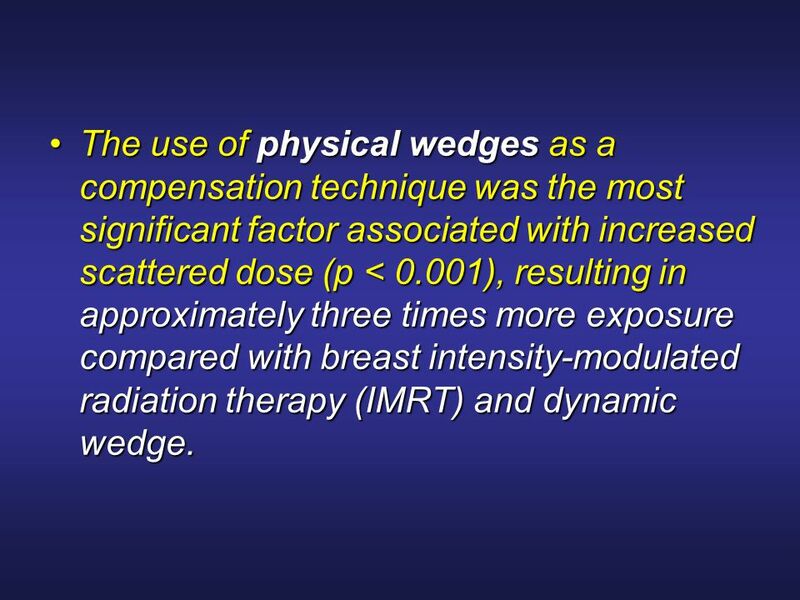 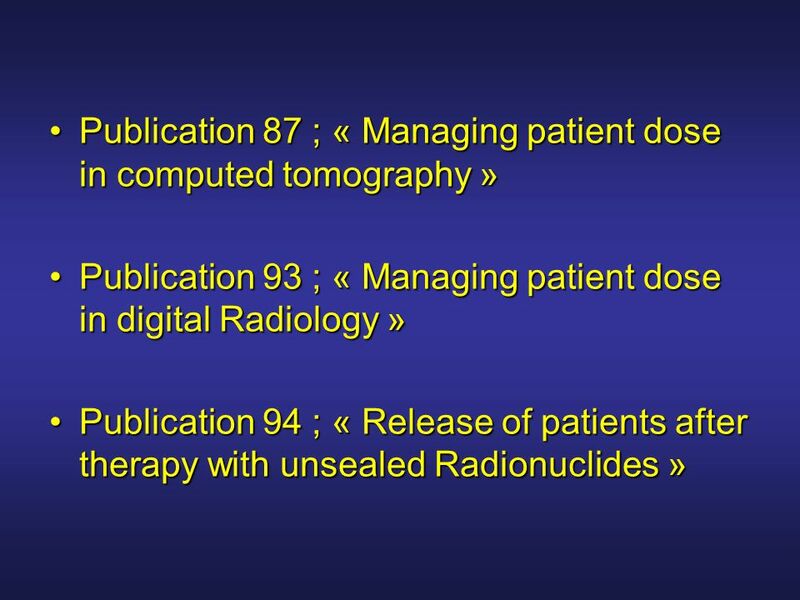 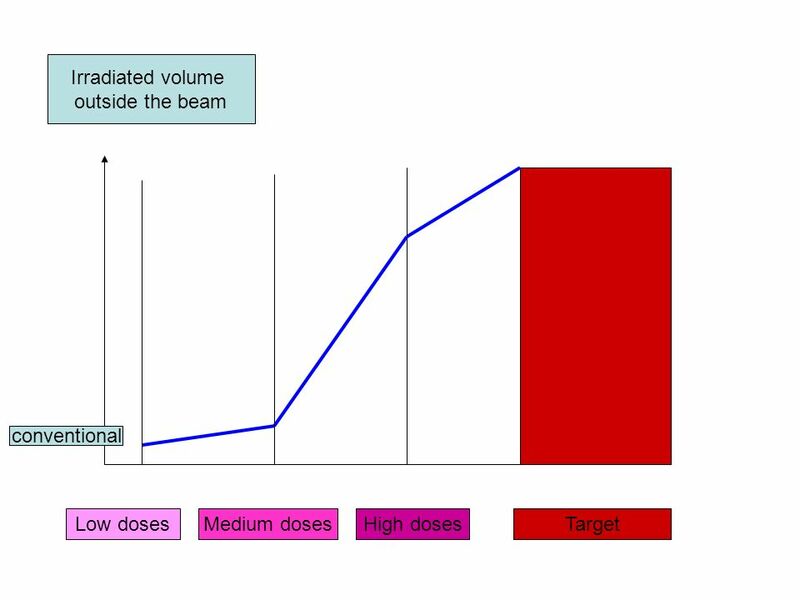 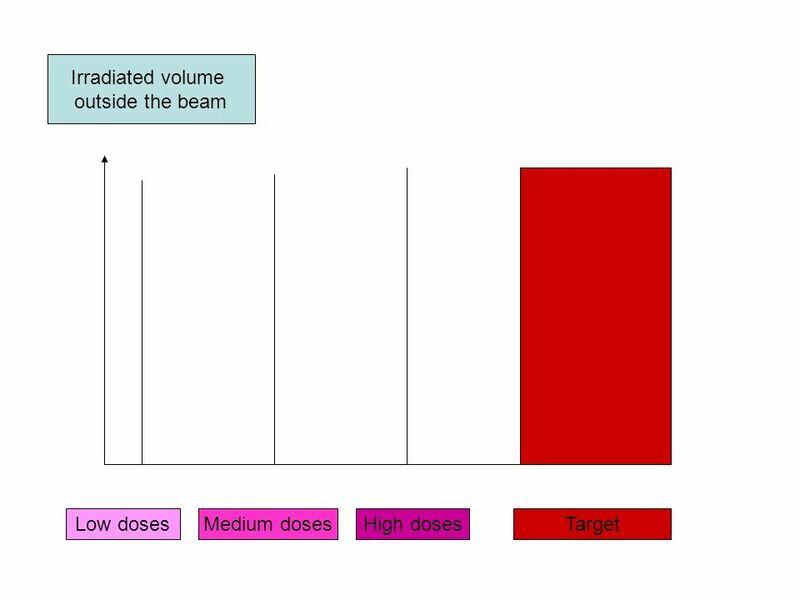 88 The use of physical wedges as a compensation technique was the most significant factor associated with increased scattered dose (p < 0.001), resulting in approximately three times more exposure compared with breast intensity-modulated radiation therapy (IMRT) and dynamic wedge. 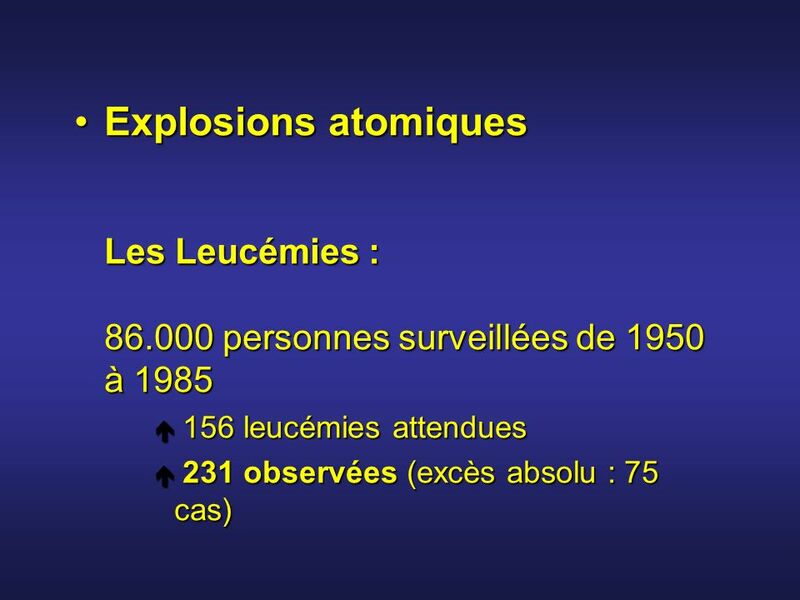 89 Conventional with wedges ? 94 Where is the right curve ?? 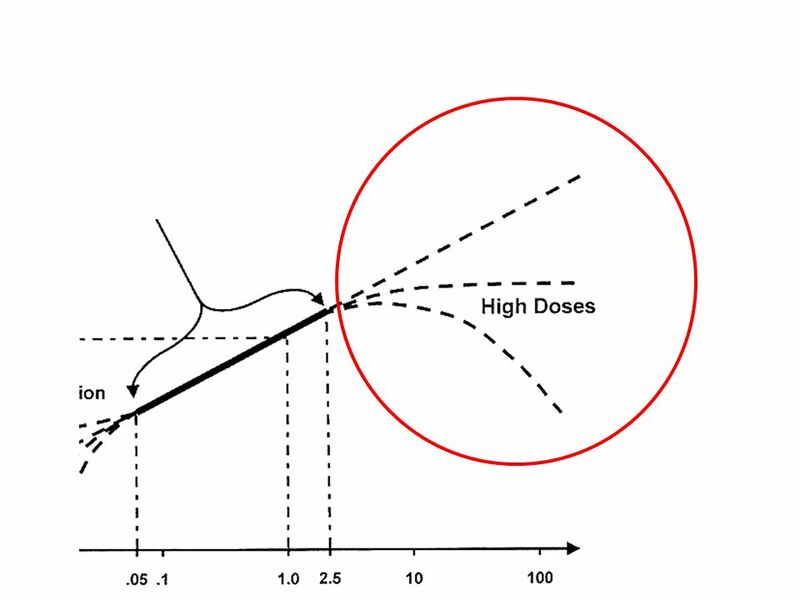 95 Where is the right curve ?? 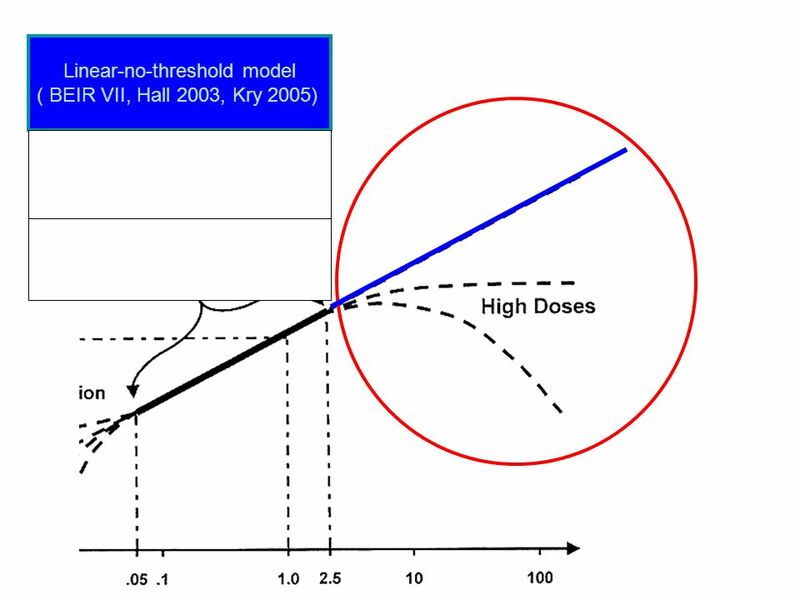 Eric Hall, 2006 This one ? 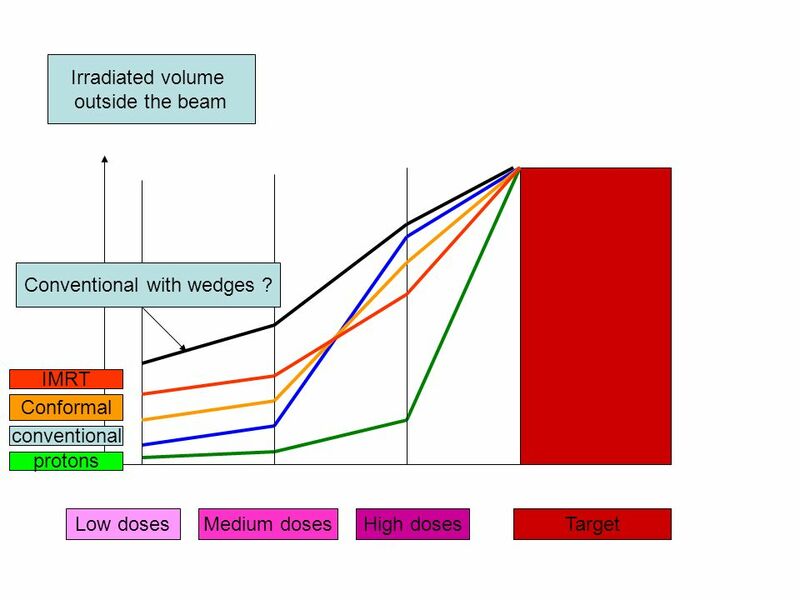 96 Where is the right curve ?? 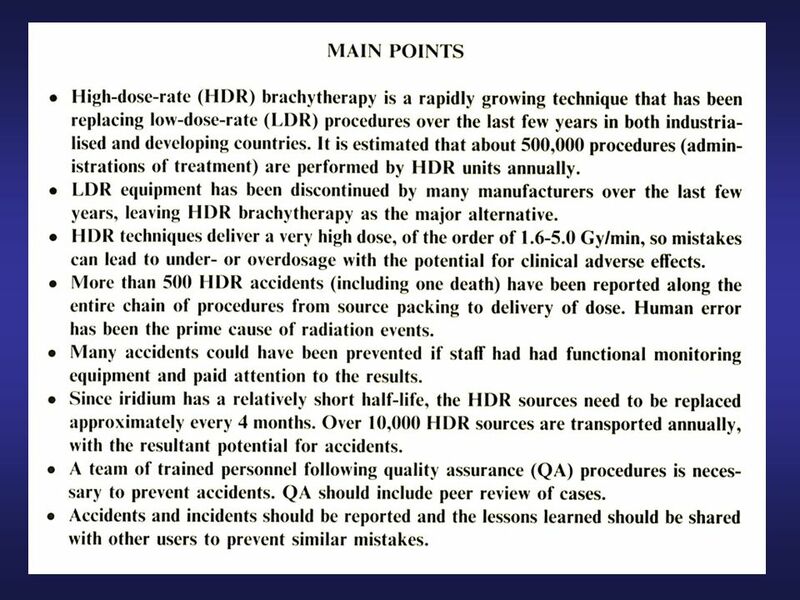 Eric Hall, 2006 Or this one ? 97 Where is the right curve ?? 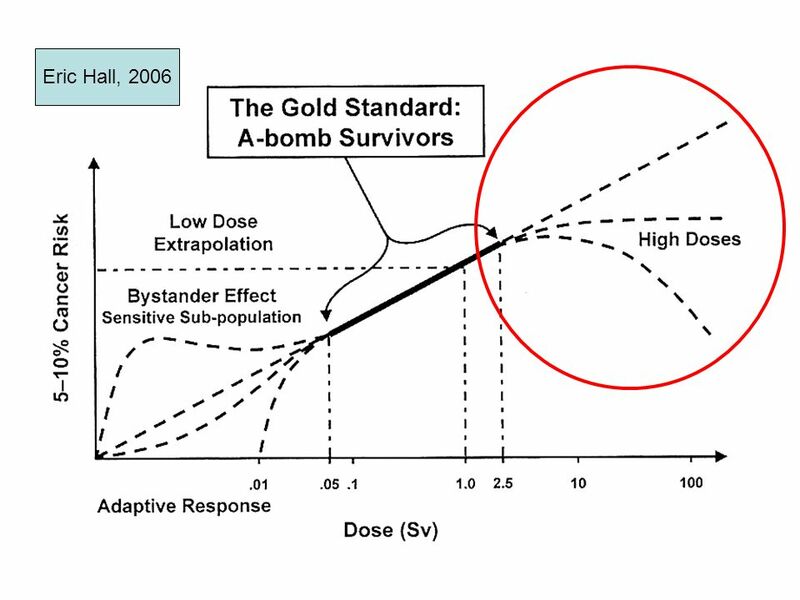 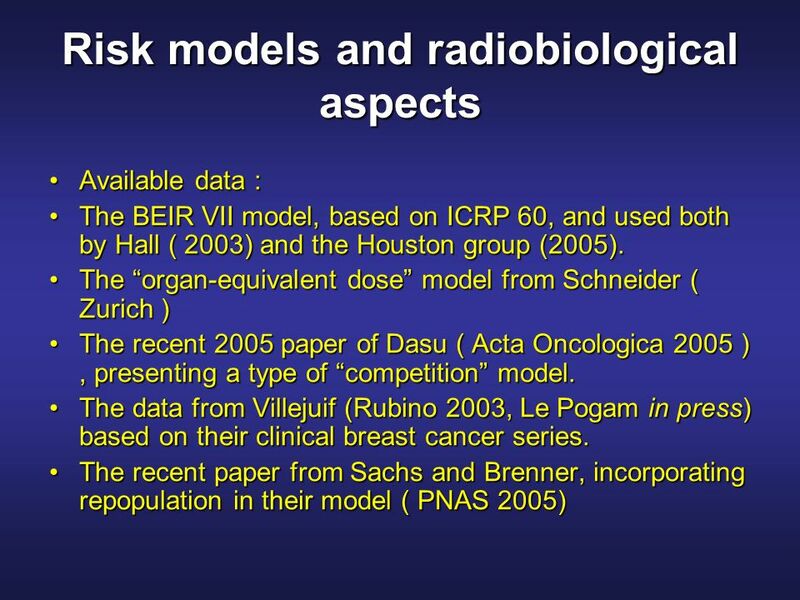 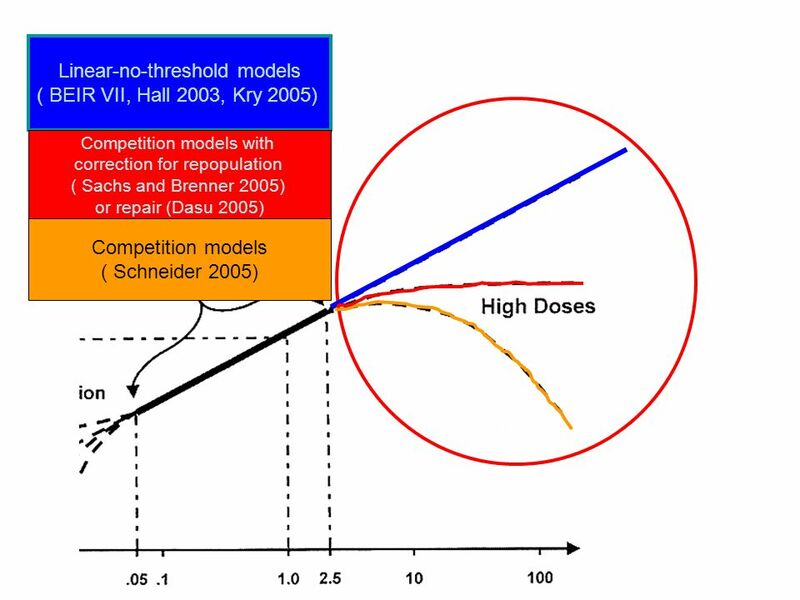 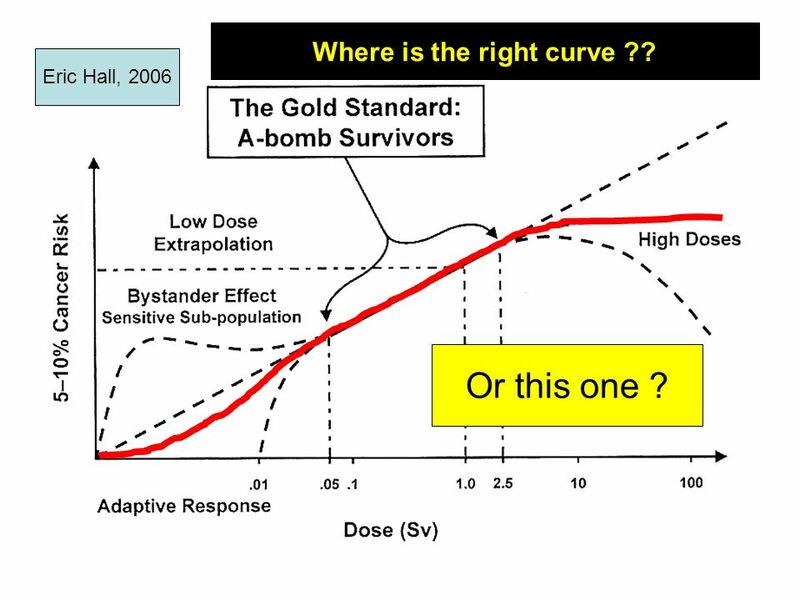 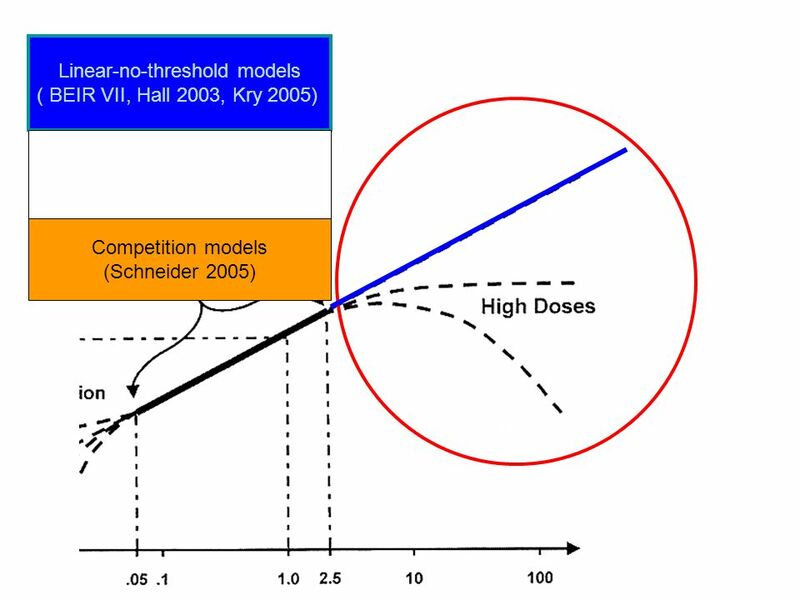 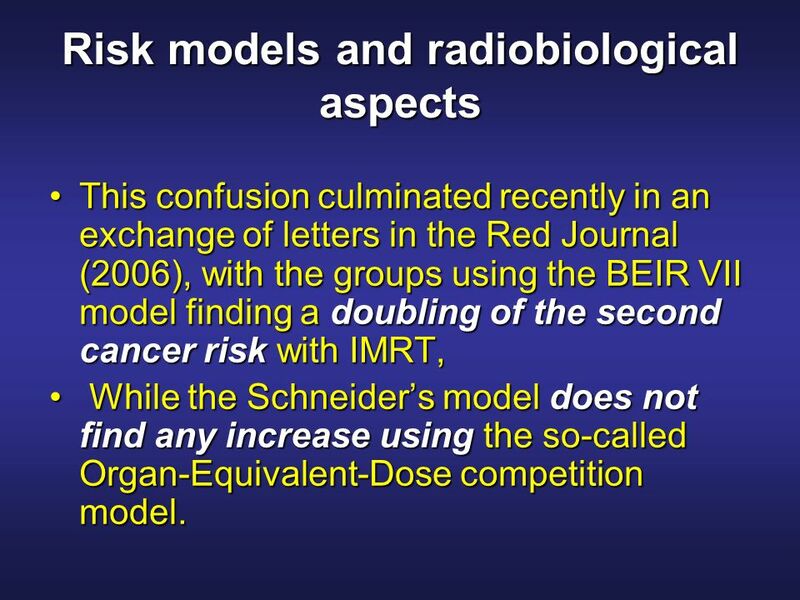 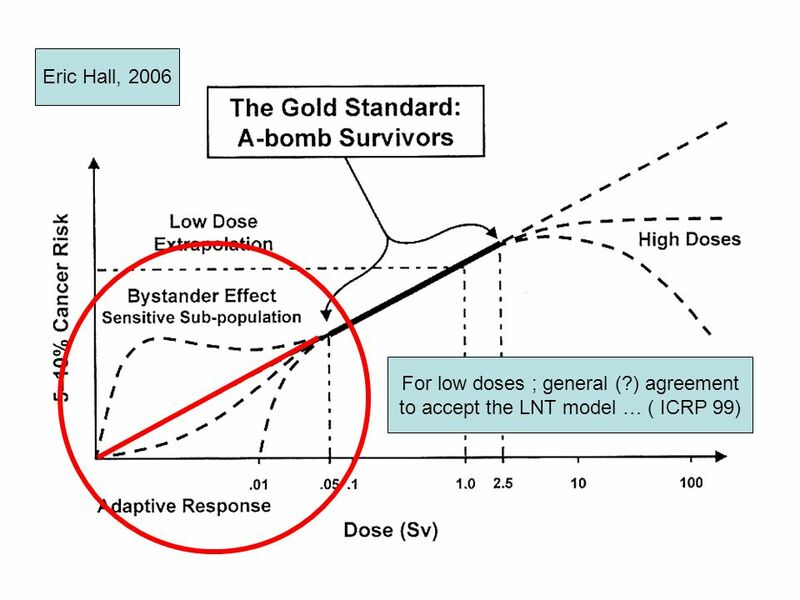 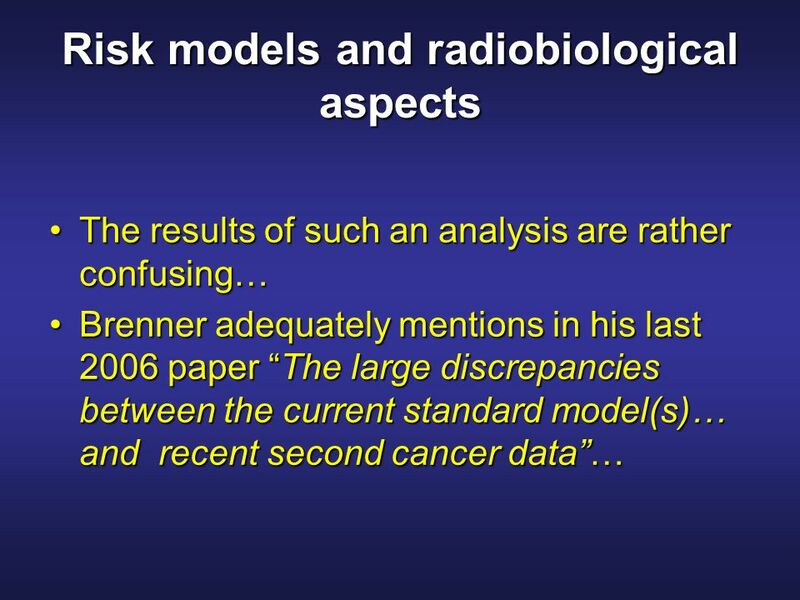 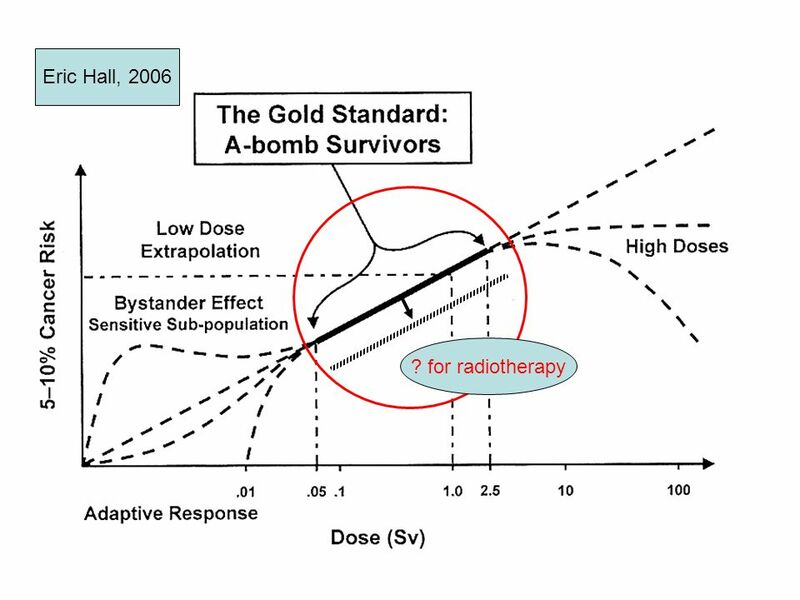 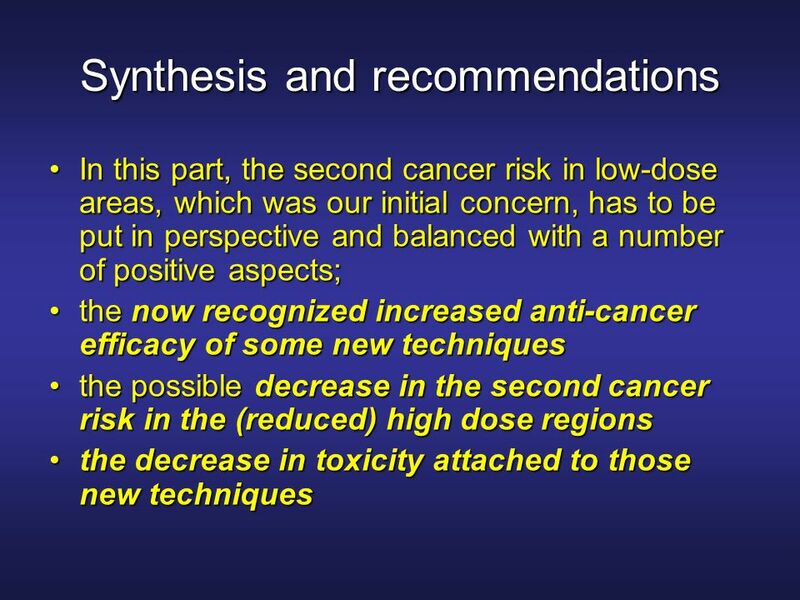 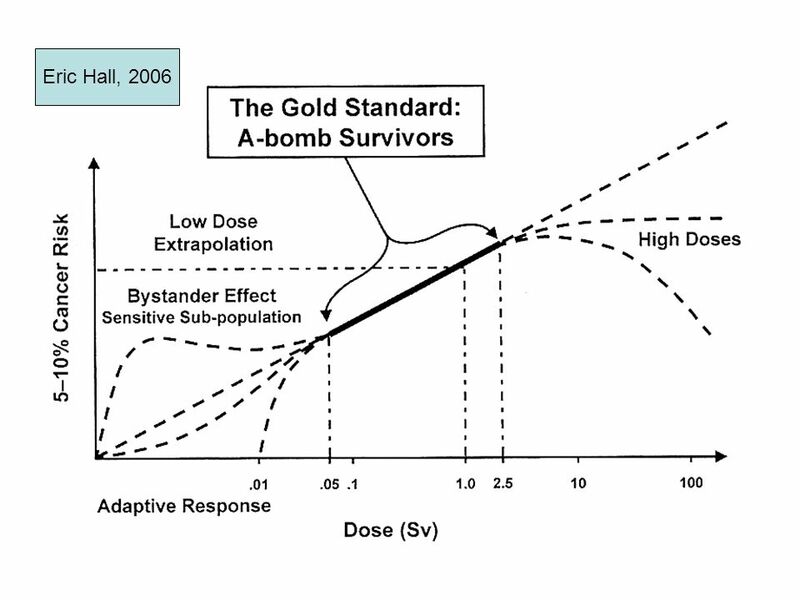 This confusion culminated recently in an exchange of letters in the Red Journal (2006), with the groups using the BEIR VII model finding a doubling of the second cancer risk with IMRT, While the Schneider’s model does not find any increase using the so-called Organ-Equivalent-Dose competition model. 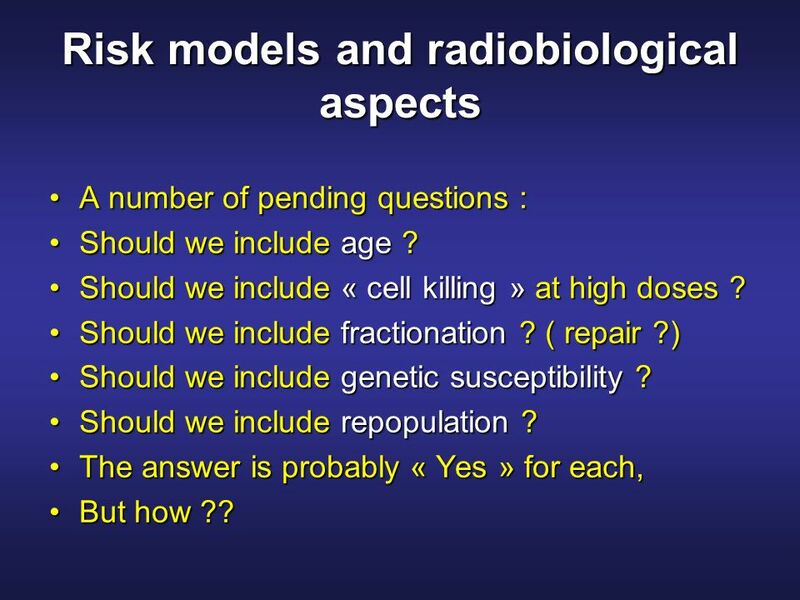 A number of pending questions : Should we include age ? 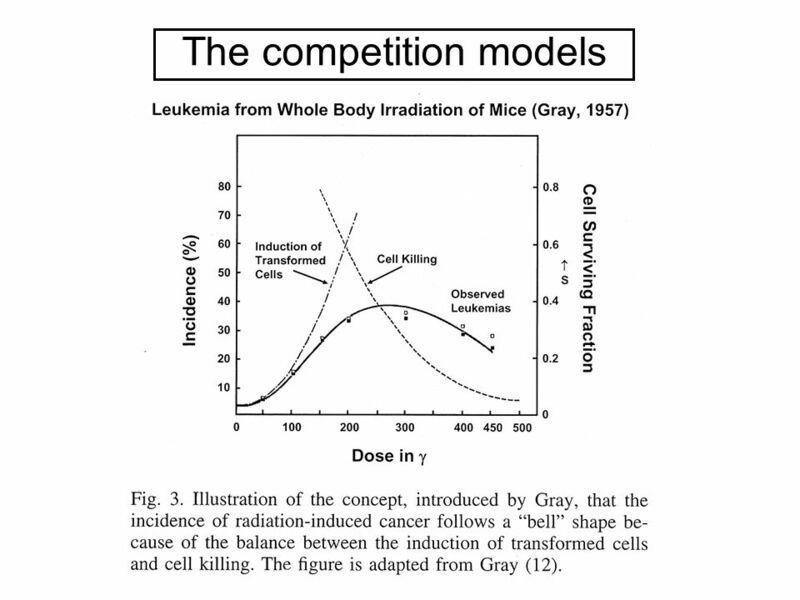 Should we include « cell killing » at high doses ? 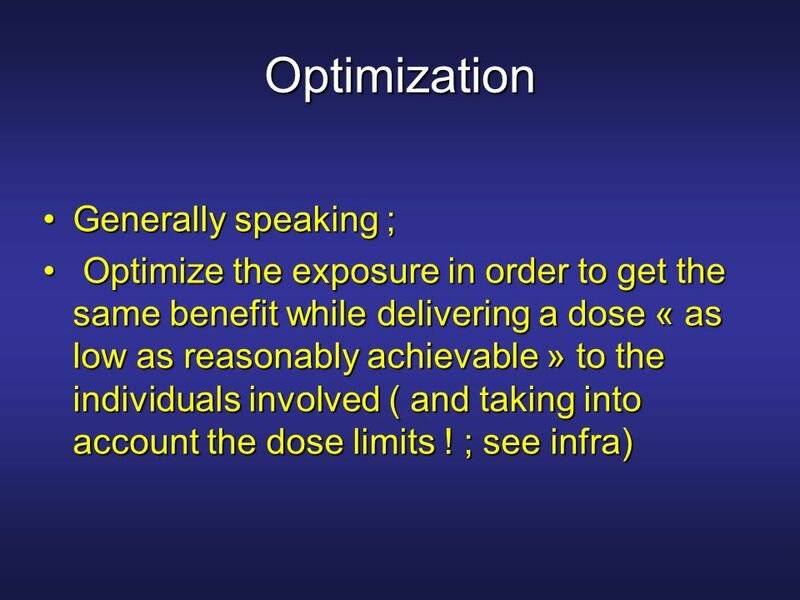 Should we include fractionation ? 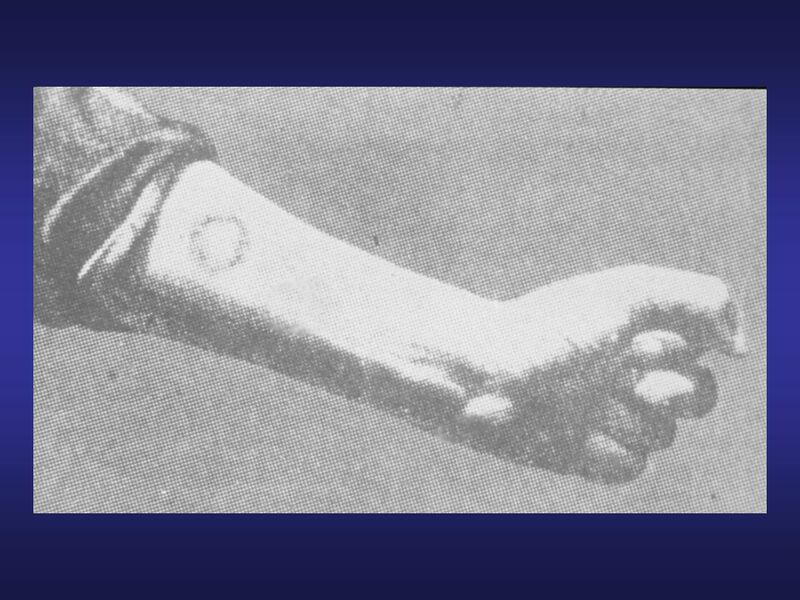 ( repair ?) 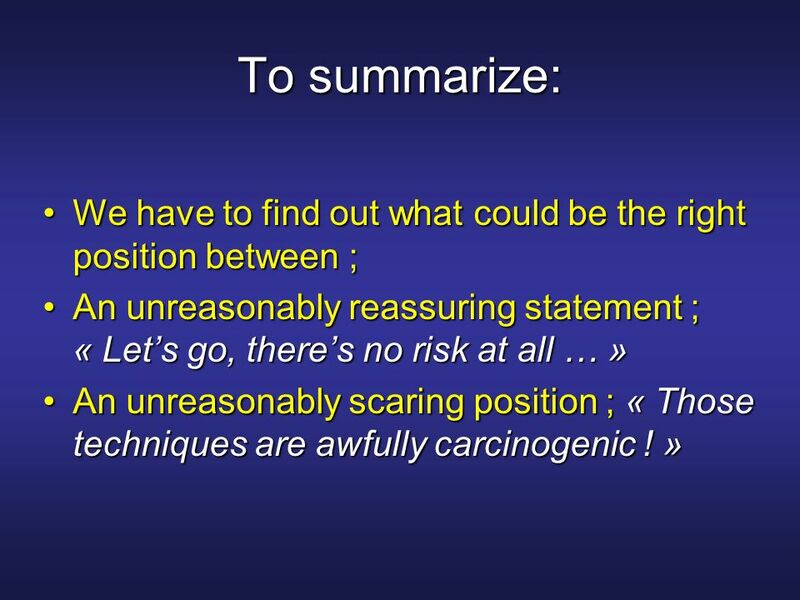 Should we include genetic susceptibility ? 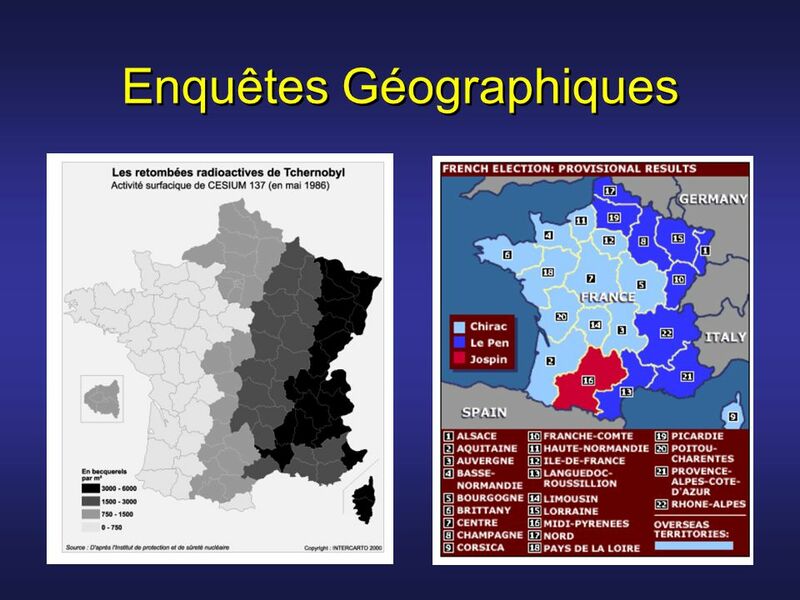 Should we include repopulation ? 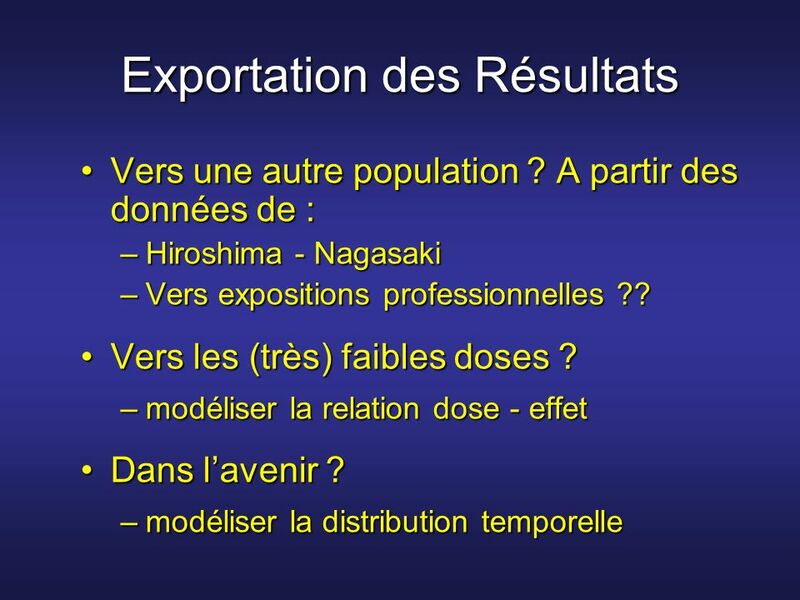 The answer is probably « Yes » for each, But how ?? 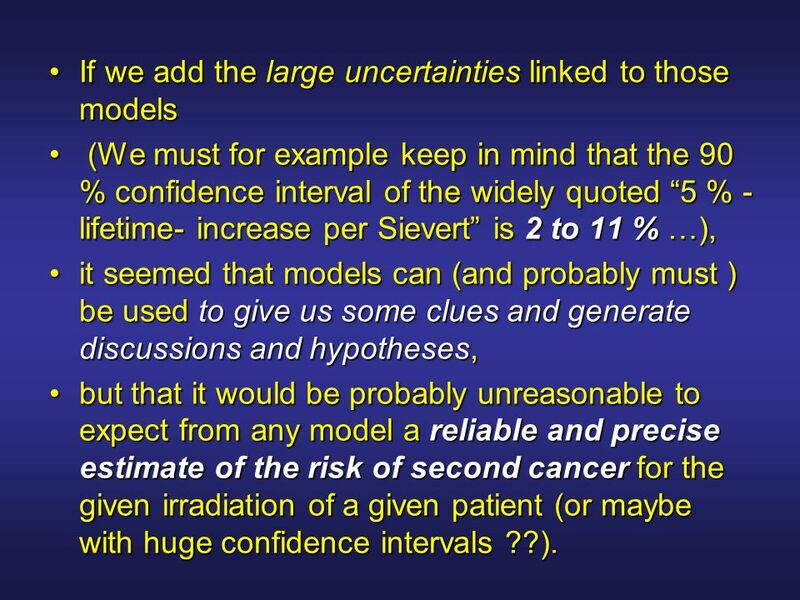 (We must for example keep in mind that the 90 % confidence interval of the widely quoted “5 % -lifetime- increase per Sievert” is 2 to 11 % …), it seemed that models can (and probably must ) be used to give us some clues and generate discussions and hypotheses, but that it would be probably unreasonable to expect from any model a reliable and precise estimate of the risk of second cancer for the given irradiation of a given patient (or maybe with huge confidence intervals ??). 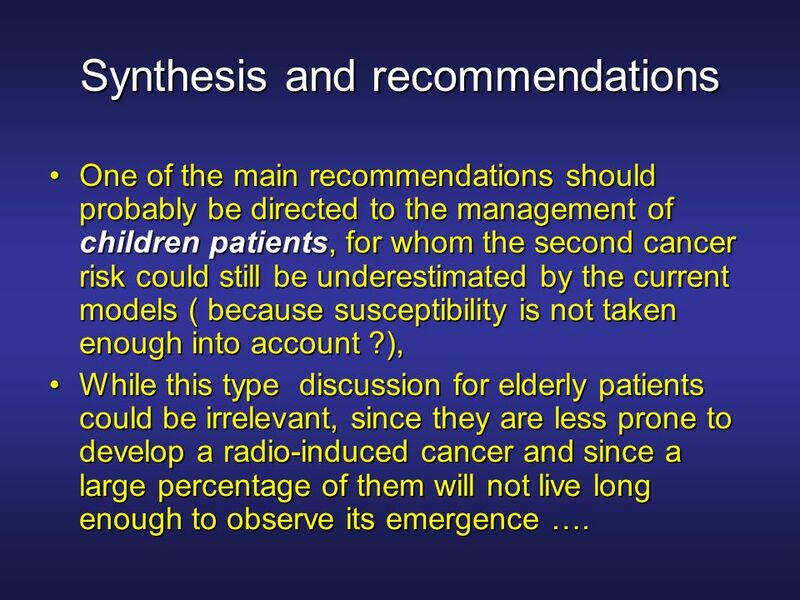 One of the main recommendations should probably be directed to the management of children patients, for whom the second cancer risk could still be underestimated by the current models ( because susceptibility is not taken enough into account ? 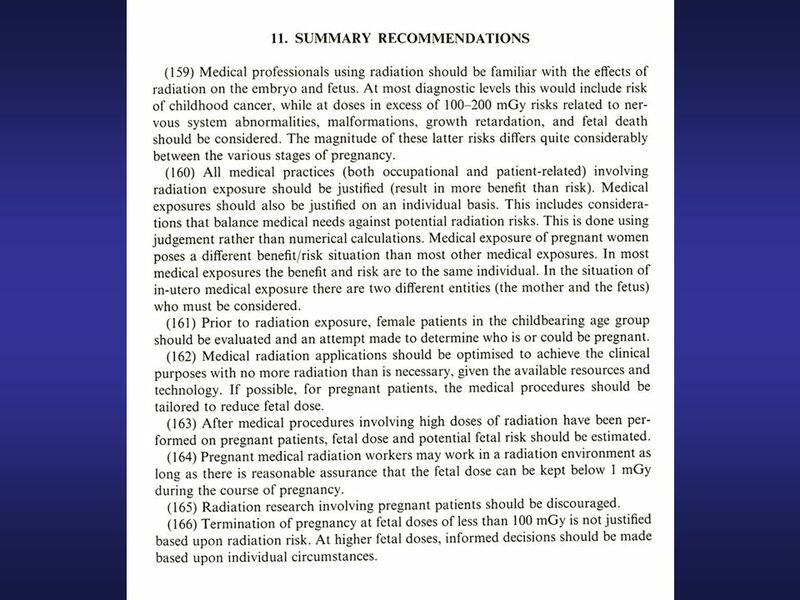 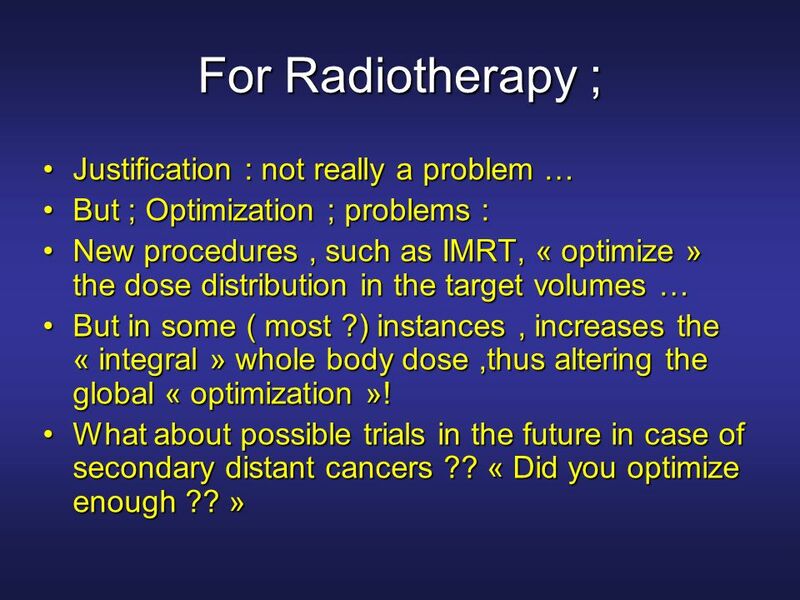 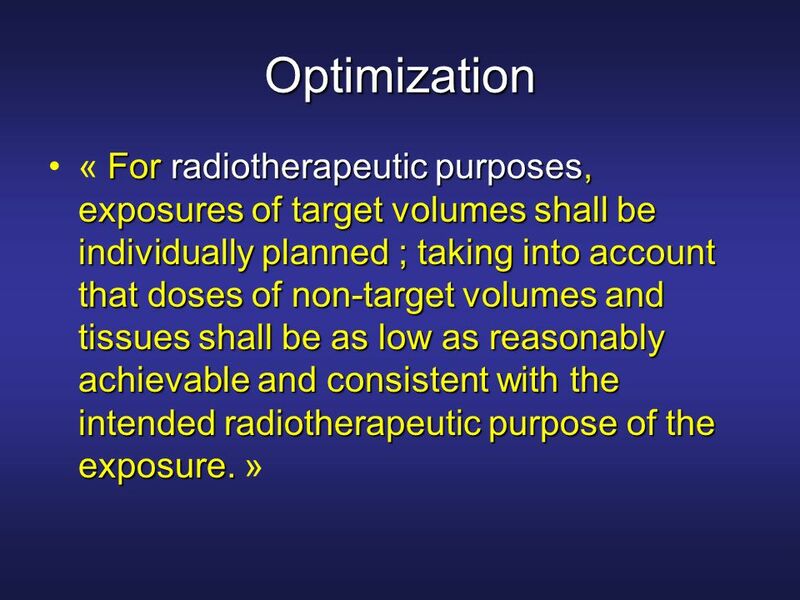 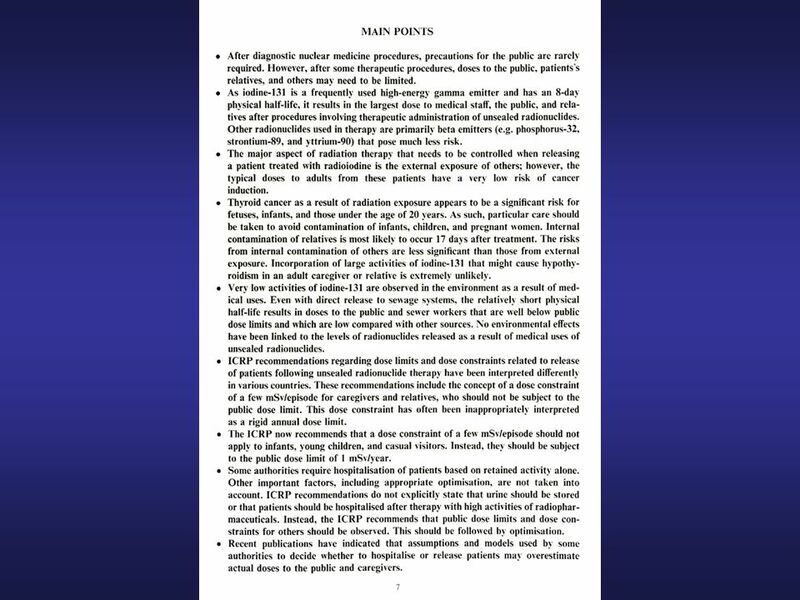 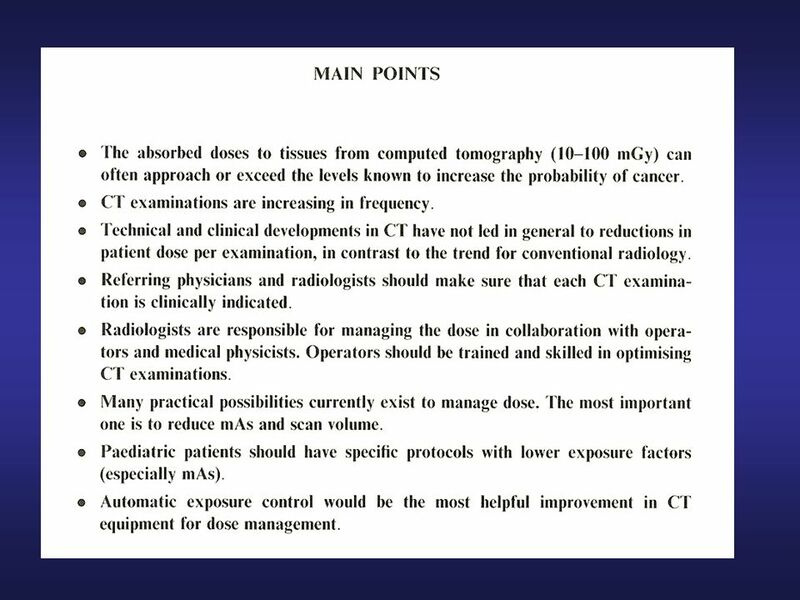 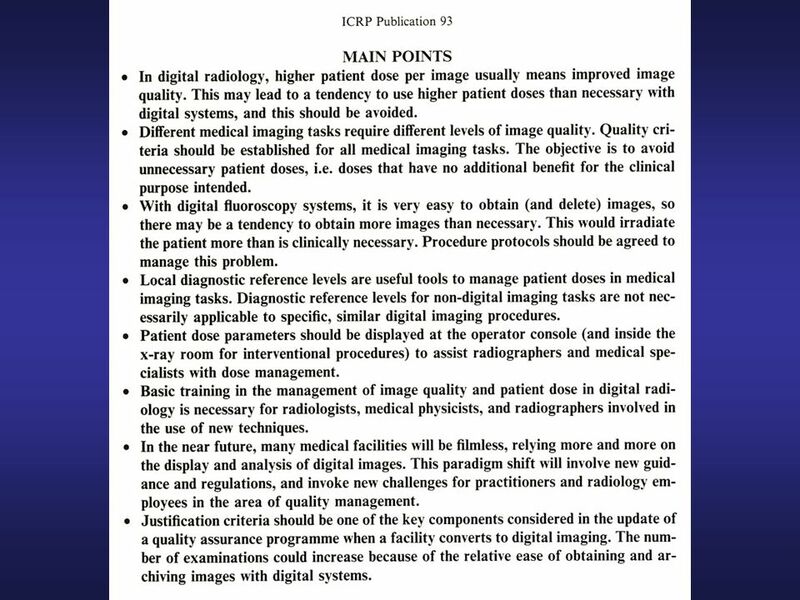 ), While this type discussion for elderly patients could be irrelevant, since they are less prone to develop a radio-induced cancer and since a large percentage of them will not live long enough to observe its emergence …. 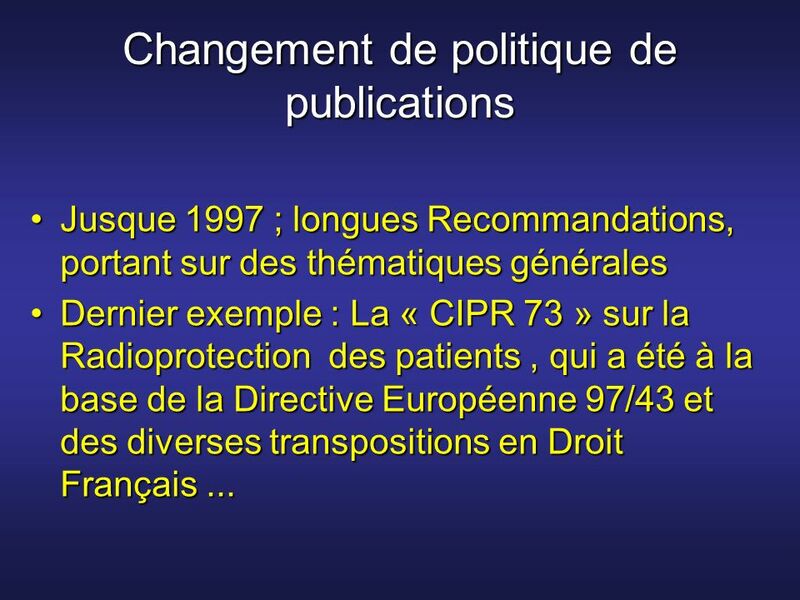 Télécharger ppt "Aspects médico-légaux Une introduction"
Information Theory and Radar Waveform Design Mark R. bell September 1993 Sofia FENNI. 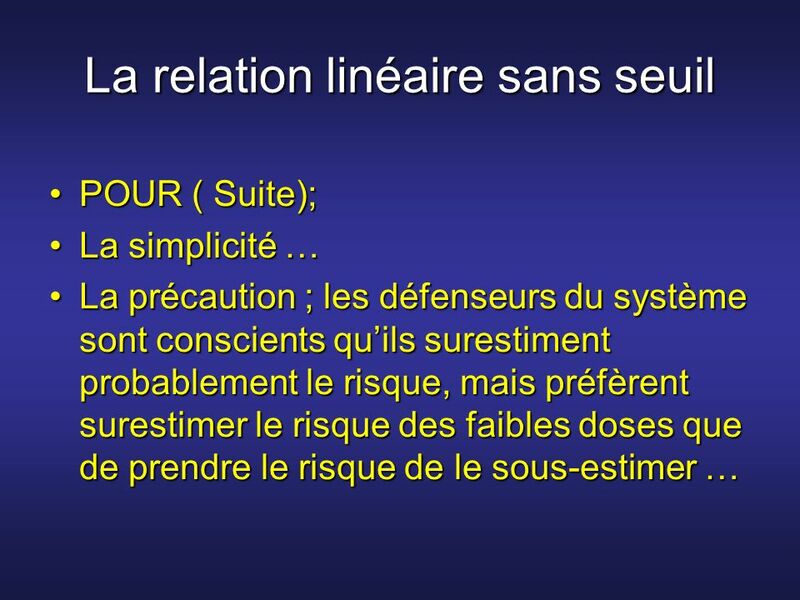 Mon uniforme scolaire WALT: Revise words for clothes and be able to give opinions about my school uniform. 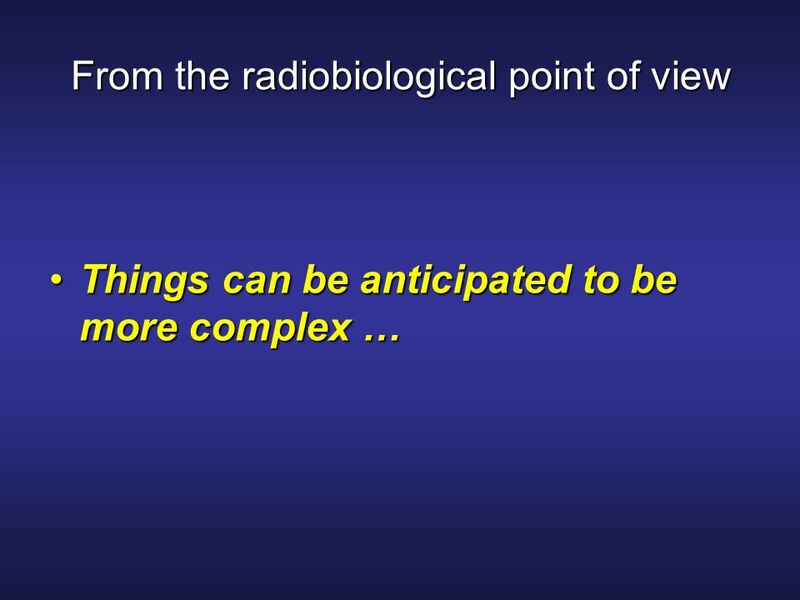 WILF: Using more complex descriptions and opinions. 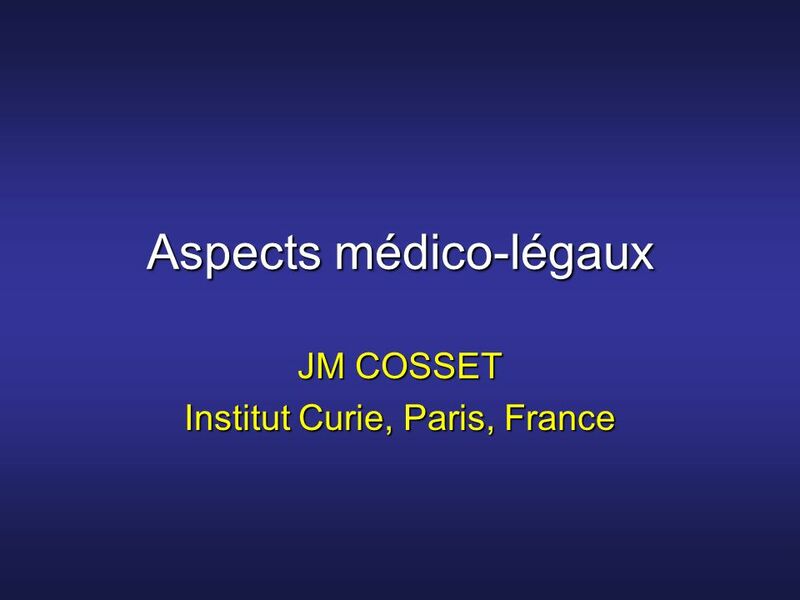 Adolescents - supporting their transition to adulthood Adolescents - soutenir la transition vers l’âge adulte. 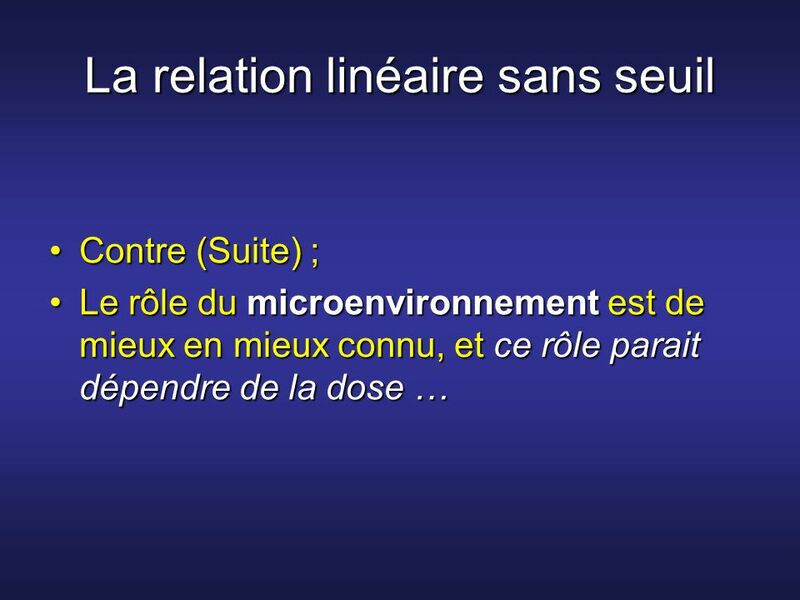 La norme Iso26000 La norme ISO définit comment les organisations peuvent et doivent contribuer au développement durable. 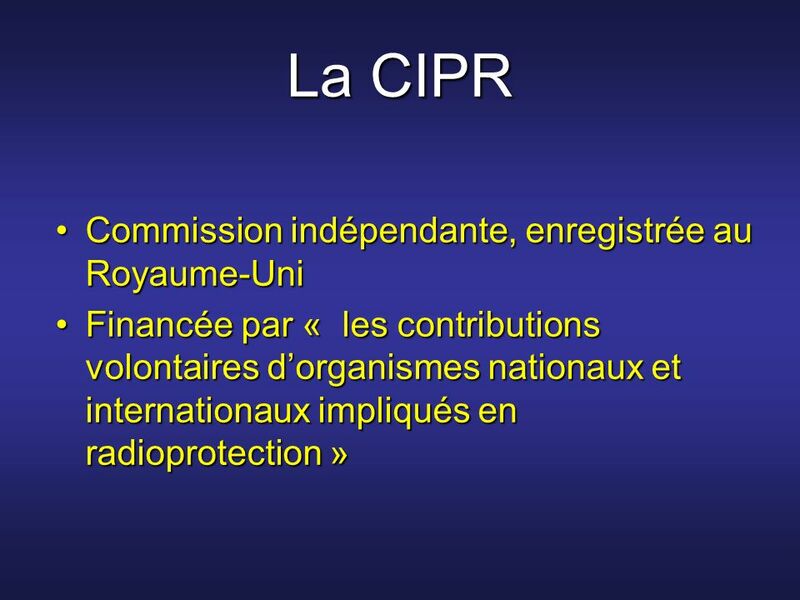 Elle est publiée depuis. 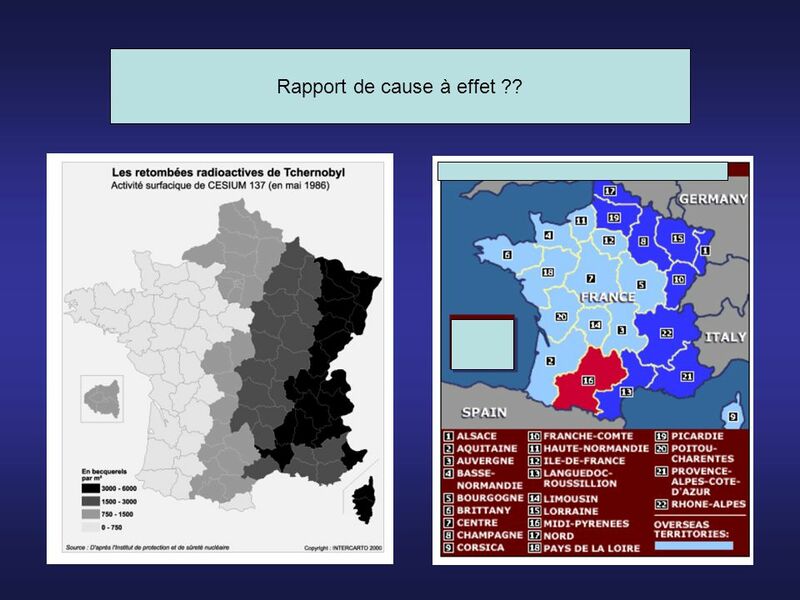 Français II Le projet – Le voyage en France. 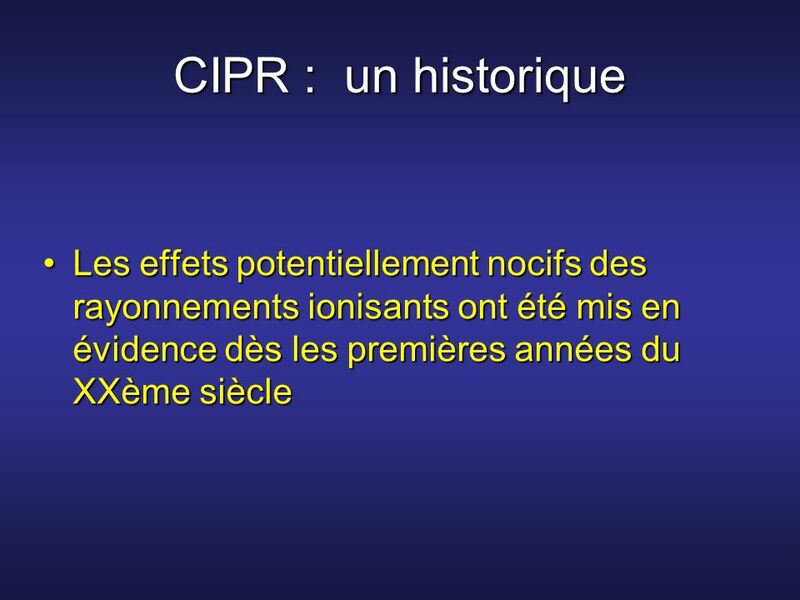   You are writing a travel/photo journal in order to keep track of your great trip to the cities of France. 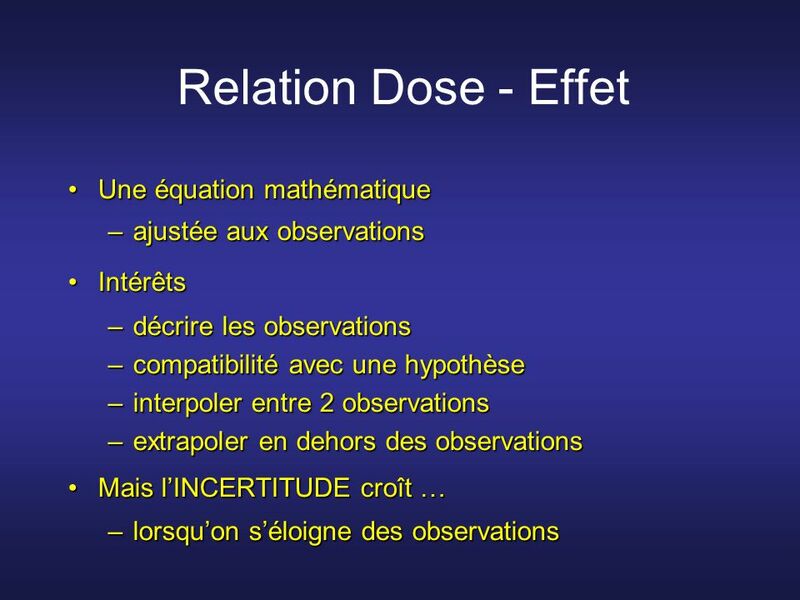 Quelle force que celle de s’accepter comme on est ! 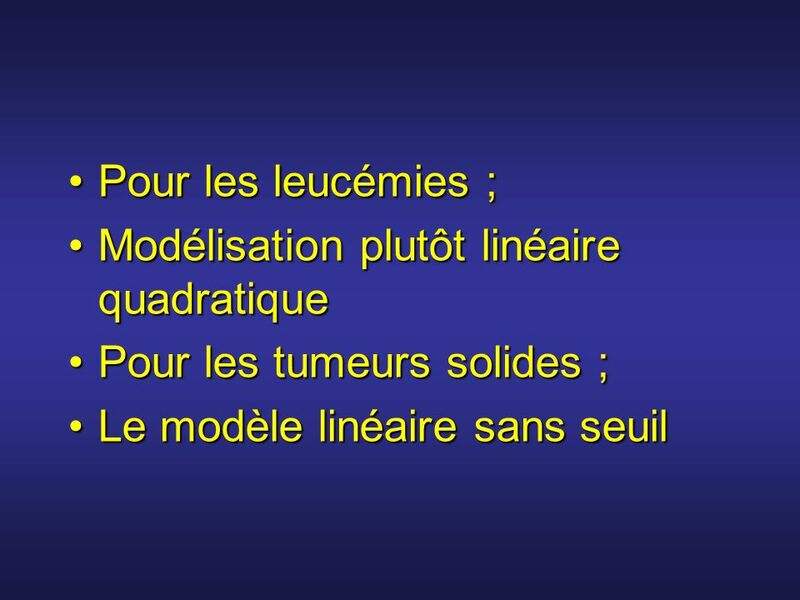 Français III projet cinématique (votre film). 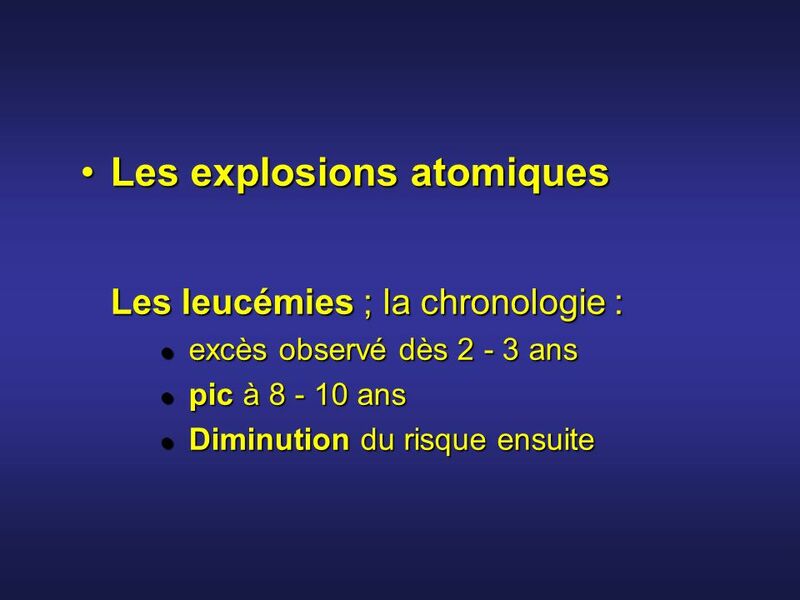 les critères Create a 3 minute film with a 1 minute introduction. 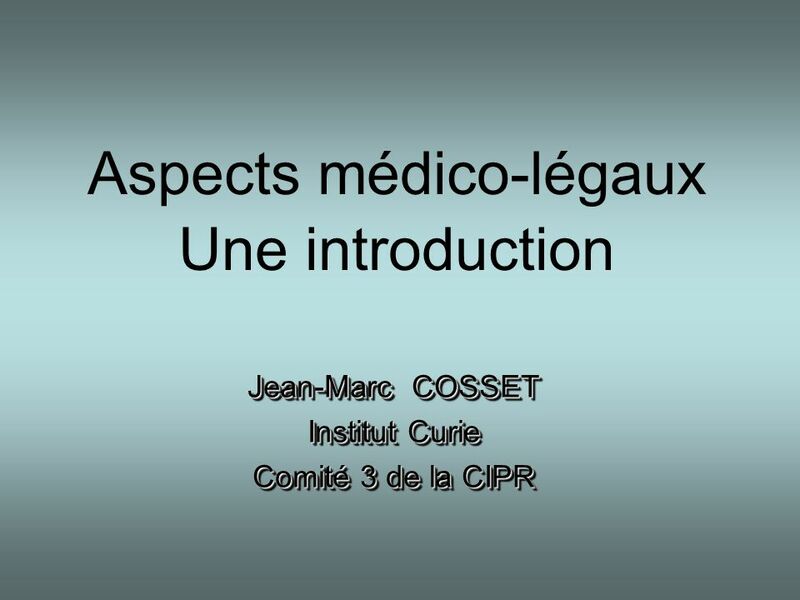 The introduction must explain briefly. 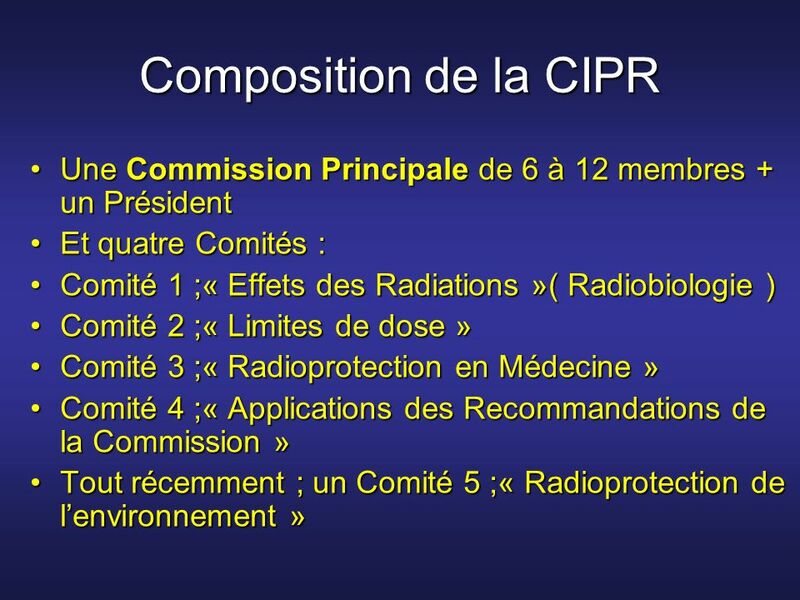 Unité 6 Leçon B. 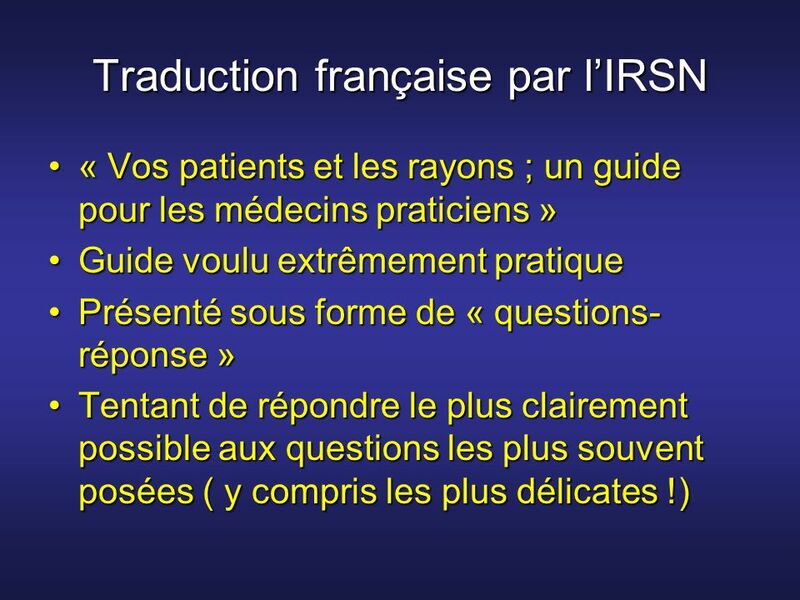 Forming yes/no questions  To form a yes/no question in French in the simplest way, add a question mark at the end of the sentence, and.